Space...the Final Frontier. 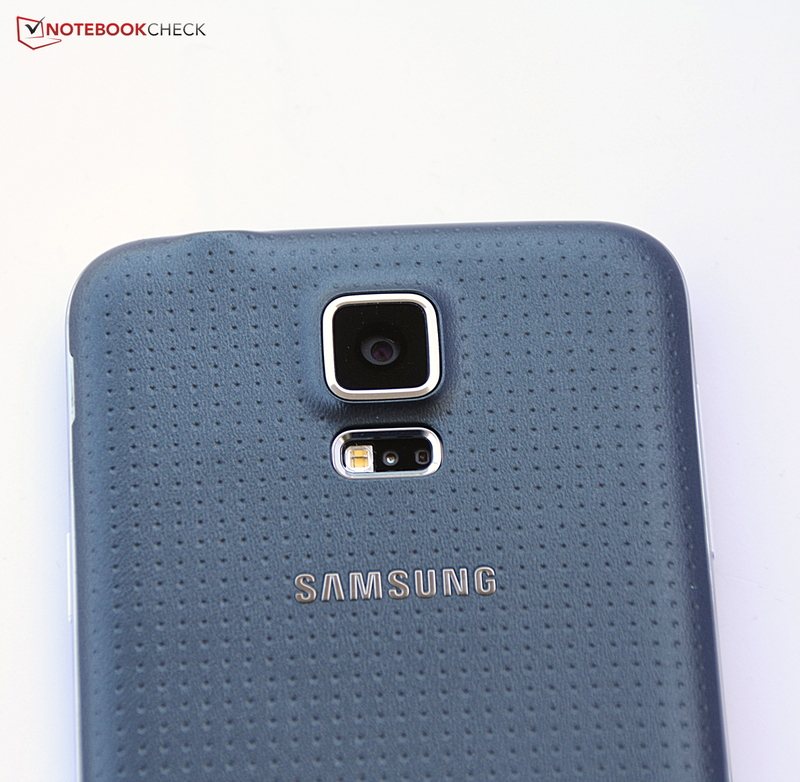 These are the voyages of the starship Notebookcheck as she continues her mission to explore the (Samsung) Galaxy S5. 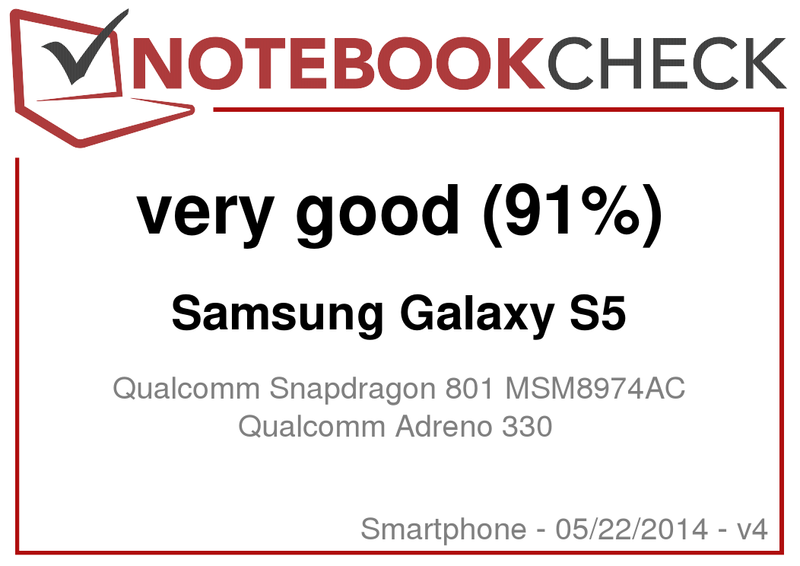 The crew is hoping for a result that is out of this world - and although the scores fall slightly short of expectations, the S5 nonetheless earns the smartphone-crown. It's that time again: every year in spring, we are treated to a parade of new high-end smartphones. We already took a look at the HTC One M8 which - in our opinion - lacks real innovation. More security, less power consumption, additional fitness features: with their perennial sales favorite Galaxy S, Samsung is trying to up the ante once again. Some of the advertised features sound promising: dust, no matter if from this earth or not, as well as water are supposedly not a problem for the smartphone, even though the removable back cover and replaceable battery are carry-overs from the predecessor. The camera was improved with a faster autofocus and now sports selective focus., which seems to be an almost mandatory feature nowadays. 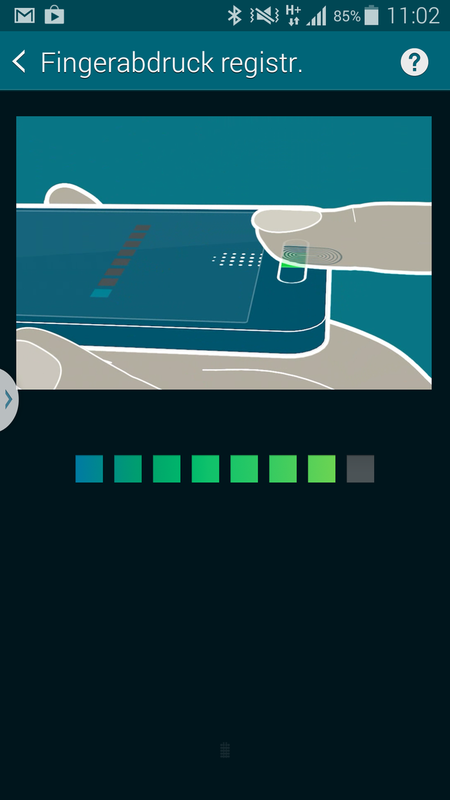 The Galaxy S5 features a fingerprint reader as well as built-in heart rate sensor. 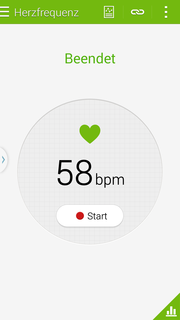 Bones would love the (optional) Galaxy Gear Fit, which measures the heart frequency at the wrist and transfers it to the smartphone. 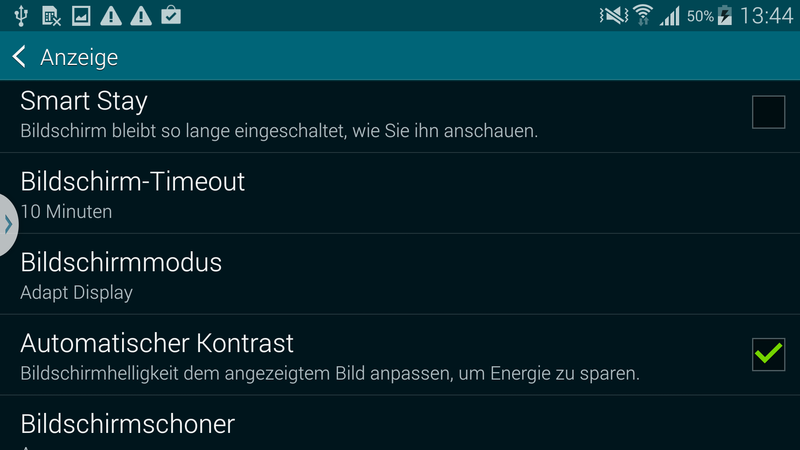 The "Download Booster" combines LTE and WLAN to allow for super-fast downloads, while the "Ultra Power Savings Mode" saves and extends the battery life. 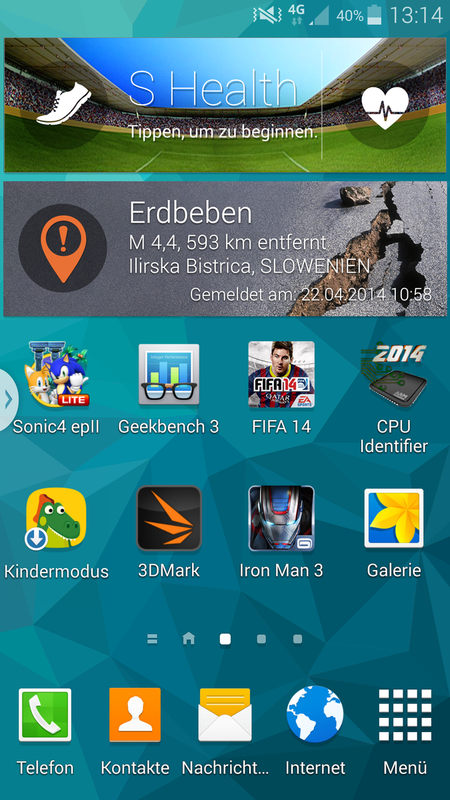 The HTC One M8 has a similar and quite useful feature. Other contenders for the title of the best smartphone are the iPhone 5s, the previously mentioned HTC One M8, the Google Nexus 5, and the LG G2. The next generation of the Nokia Lumia 925 and the Sony Xperia Z1 will be available soon, although the current models are still a very good (and now less expensive) high-end choice. Also added to the mix: last year's Galaxy S4. 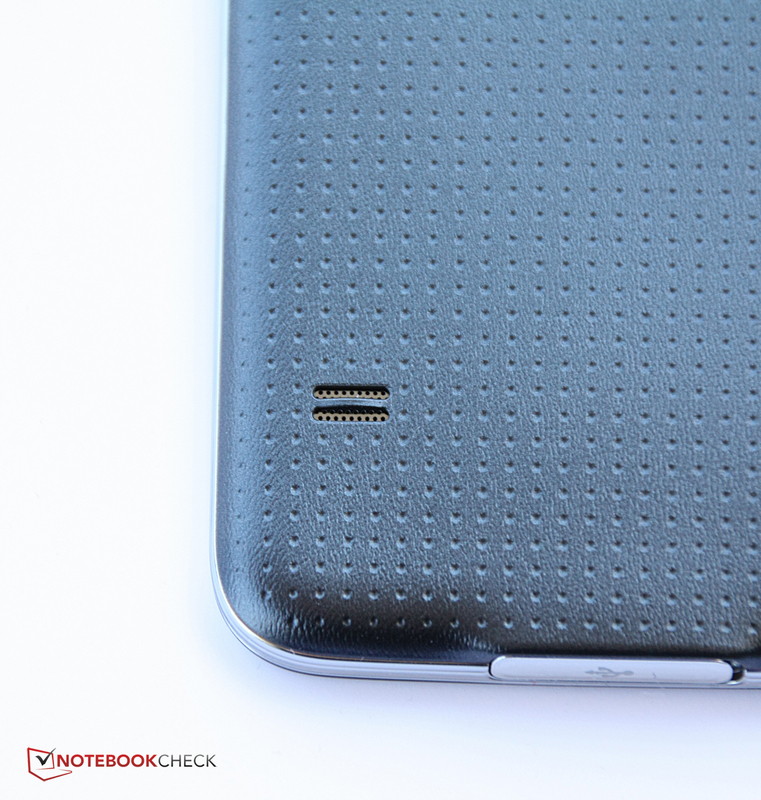 Compared to the HTC One M8, not quite as high-end: the case design. The battery can be swapped out. The Galaxy S5 doesn't offer anything groundbreaking as far as its design is concerned, so we'd probably call it a "cautionary evolution". In other words: those who liked the Galaxy S4 will have no problem with the Galaxy S5. The back cover is either a glossy black, gold, blue, or white; the latter is also white up front. All phones have a chrome trim around the perimeter. 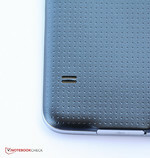 The back is removable and offers access to the battery, micro-SIM, and microSD card slots. A new feature: the smartphone is now dust and water resistant according to standard IP67. 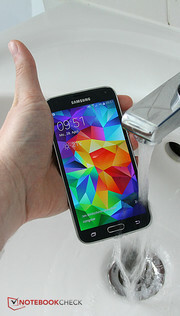 The Galaxy S4 Active also offered the same protection, but the feature is new this year for the high-end model of the Galaxy S series. 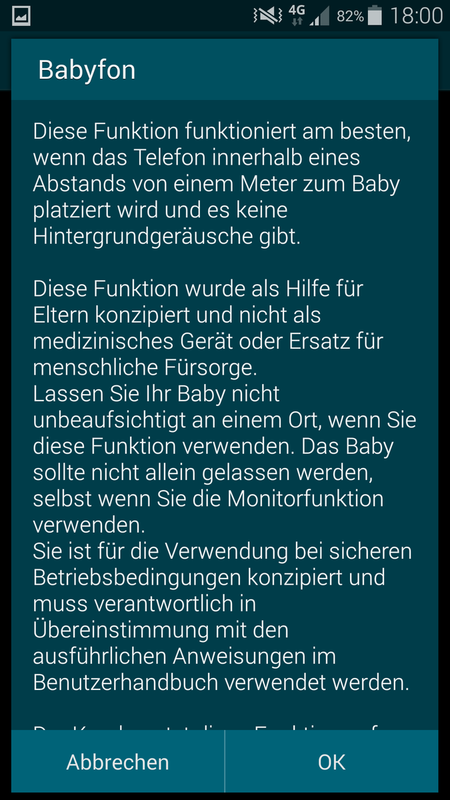 Of course, this kind of resilience is a nice-to-have feature and makes the phone suitable for constructions sites and swimming pools. We found the frequent pop-up messages asking to make sure that the back cover and the cover for the USB port are attached a bit annoying - but of course, water or dust could get inside otherwise and damage the phone. Just like the HTC One M8, the new Samsung smartphone requires a little more room to house all the new features. 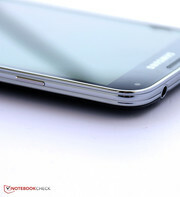 The thickness has increased to 8.1 mm; the predecessor Samsung Galaxy S4 measured 7.9 mm. The larger display also necessitated an increase in length and width. The Galaxy S5 is thinner (8.1 vs. 9.35 mm) and about 10 mm shorter than the One M8, since HTC had to incorporate their excellent stereo speakers. A high-end smartphone needs to be very sturdy - and the Galaxy S5 fits the bill, as we couldn't affect the display at all when we exerted pressure on the front or the back. We do like the plastic case design, as it feels upscale and is easy to hold. 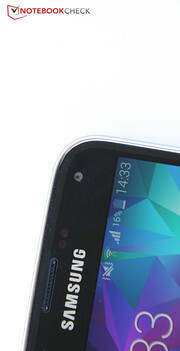 The slightly glossy back looks good and is not really that susceptible to fingerprints. 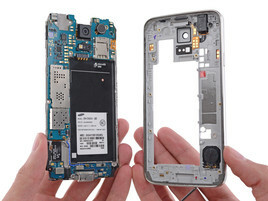 Samsung's design approach goes to show that the construction doesn't always have to all-metal, although the Galaxy S5 is not quite as sturdy and resilient as the unibody HTC One M8: the upper corners can't completely resist torsional forces and the cover protests with slight creaking sounds when very firm pressure is applied. 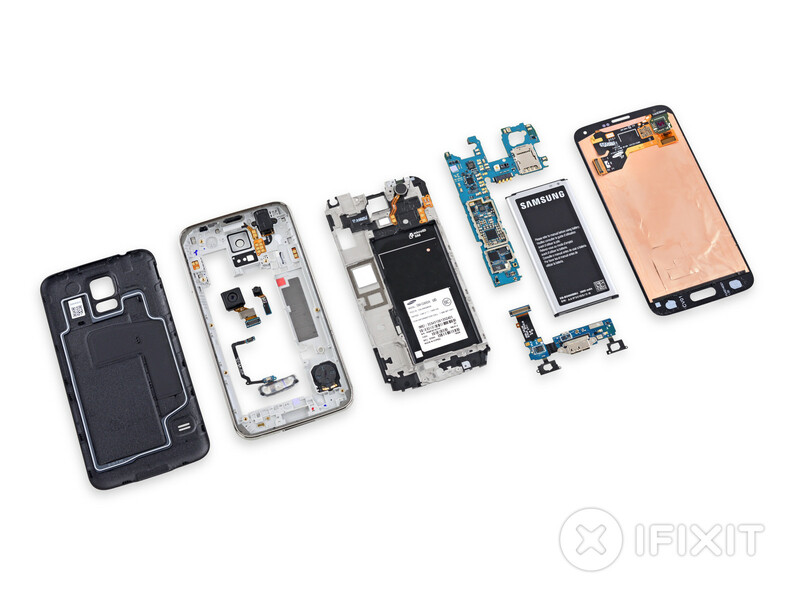 As far as the HTC One M8 is concerned, we had to agree with our colleagues from iFixit and criticize that the smartphone really can't be serviced at all. That's not only bad for the environment, but also for the pocket book, since repairs after the warranty period are probably cost prohibitive. The Samsung Galaxy S5 at least scores 5 out of 10 possible points: the battery can be removed easily, but all other parts require specialized tools. Replacement of the screen - one of the parts that needs to be swapped out more often than others - requires a lot of skill, since the panel is glued into place. Disassembly also requires the removal of numerous cables. Overall, ease of maintenance takes a step backwards, as the predecessor scored 8 out of 10 points here. 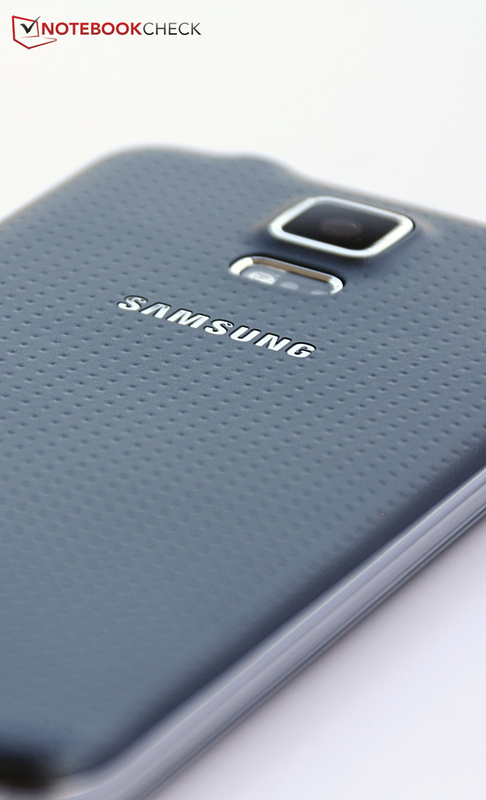 Compared to the HTC One M8, the Galaxy S5 still has a significant advantage. The Galaxy S5 is not as easy to service as its predecessor. Because the battery can be swapped out easily, the smartphone still receives an average score. 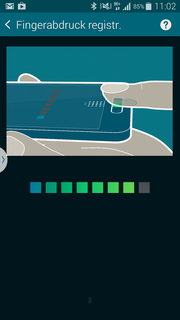 What was revolutionary for the HTC One M8 is a standard feature of the Galaxy S5: a microSD card slot allows up to 64 GByte of additional storage; either 16 or 32 GByte of flash storage are standard. A tiny infrared transmitter on the top edge allows the S5 to function as a remote, while a USB 3.0 micro-B connector is housed on the bottom. This connector is smaller than the usual micro-USB connector, but normal micro-USB cables can also be connected. 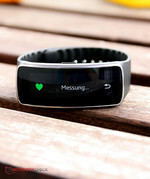 An unusual feature is the heart rate sensor on the back, which can detect the user's pulse via the finger tip. The procedure takes some getting used to, but works pretty reliably. A fingerprint scanner a la iPhone 5S is now also part of the feature set. The scanner is located under the "Home" button as well and works reliably. 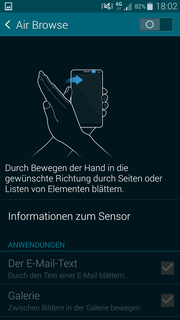 Because of the size, we found it sometimes a little difficult to unlock the smartphone using the reader, since the direction of the swipe has to be downwards and needs to cover the entire sensor. If unlocking that way shouldn't work, the user can also supply a password. The fingerprint scanner is probably one of the safest methods to lock/unlock the smartphone; those concerned with privacy won't like that the fingerprints are saved on the device. 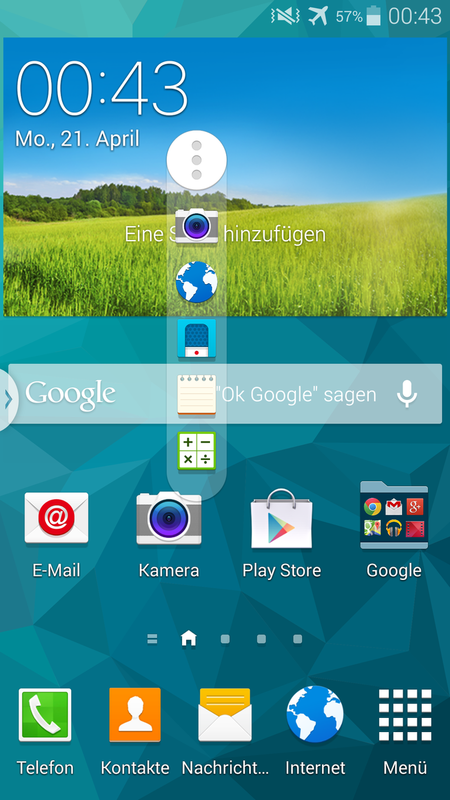 Very good: the TouchWiz interface. We've always liked Samsung's TouchWiz interface, which has a lot of features and extends the already decent functionality of the Android OS. 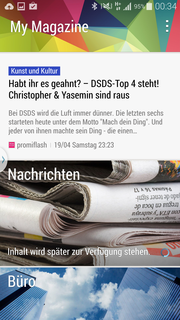 The Galaxy S5 is based on Android 4.4.2 and reminds us somewhat of the HTC smartphone: The app "Flipboard", which aggregates news and updates, is still available but now anchored on the start screen and called My Magazine. The app is similar to HTC's "BlinkFeed" and can filter in news stories and social media activities. 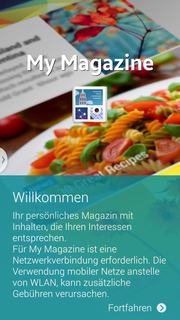 In our opinion, however, My Magazine is not quite as polished as the never version of BlinkFeed, which features location-specific tips and learns the user's interests. 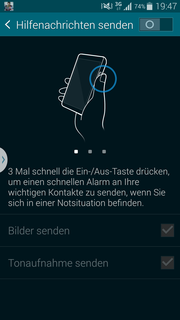 Emergency Mode - a very useful feature which we praised when we reviewed the Samsung Galaxy S4 - has been improved: the app now automatically informs the user of natural disaster in the area. Triple presses of the on/off switch can alert emergency contacts stored in the phone via a text message or even a photo. 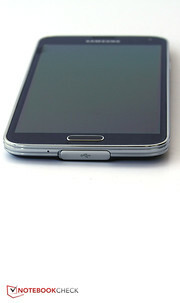 To aid in one-handed operation, the screen content can be displayed in a smaller window on the 5.1-inch display. The lock screen can display user information in case the phone gets lost. The sensitivity of the touchscreen can be adjusted to allow the use of gloves. 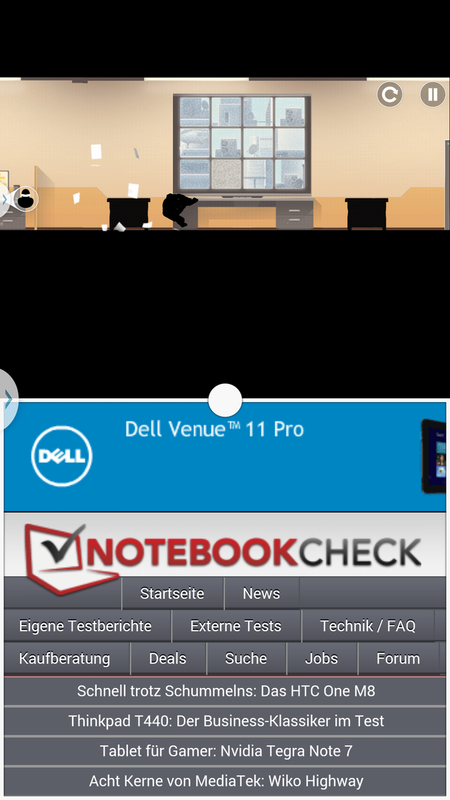 In Private Mode, the contents can be hidden from other users, while Multi Window-mode allows several apps to run at the same time just like on the Galaxy Note tablets. 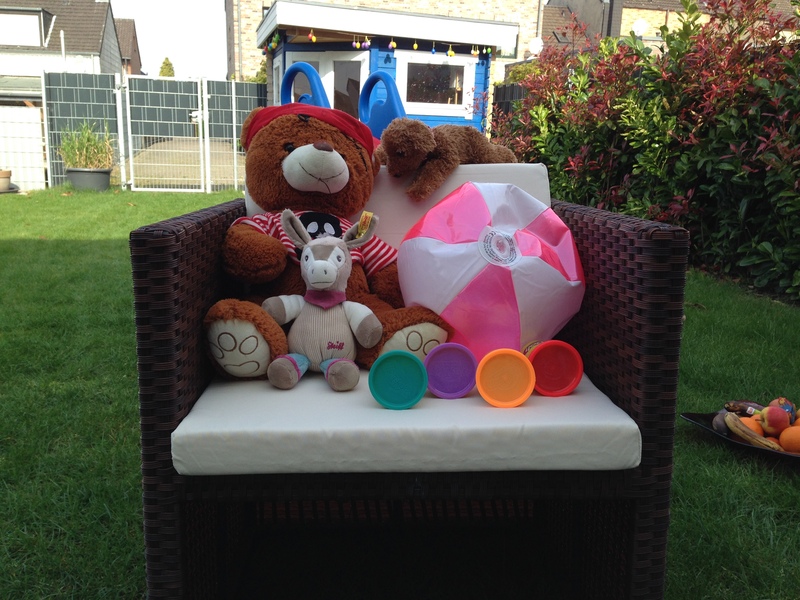 Even after using the Galaxy S5 extensively over the course of a week, we still discovered new functions. Granted, many of them are just nice-to-have features, but overall, the smartphone's operating system is implemented very well and offers a lot of functionality to please most users. 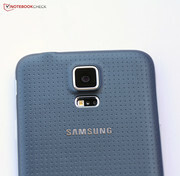 The Galaxy S5 would function well as a communicator on board of the Enterprise or during ground missions, since it supports more or less all communications standards, including WLAN standards 802.11 a/b/g/n/ac (either 2.4 GHz or 5GHz), Bluetooth 4.0, NFC, Quadband GSM and UMTS, as well as Hexaband LTE with 150 MBit/s downloads and 50 MBit/s uploads. Samsung also includes a feature called "Download Booster", which combines broadband and WiFi to allow for faster downloads of large files. This feature works as advertised, although there is a caveat: files which would normally be downloaded via wireless only are going to use the broadband as well and consequently, the user might exceed his or her plan limits. With both wireless 802.11 ac and LTE active, a staggering download speed of 1.15 GBit is possible. 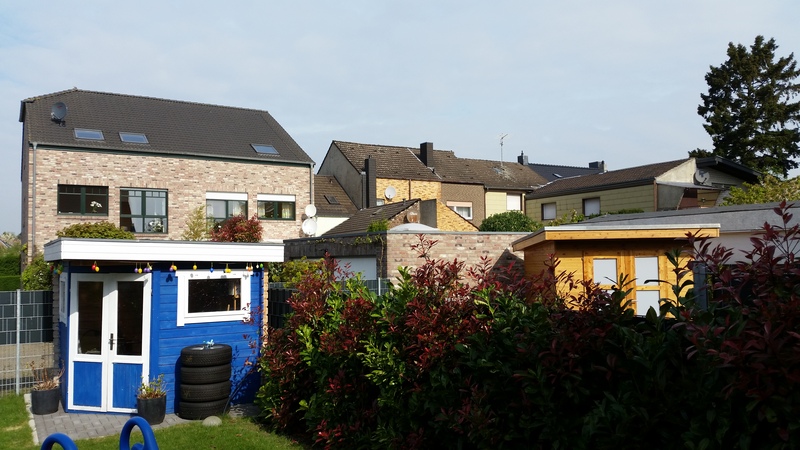 The WLAN module handles starship and other walls quite well and still showed half the signal strength 10 meters away from our router and through three walls. The HTC One M8 impressed us with even better reception quality, however. The GPS module also supports the Russian standard Glonass and China's BeiDou Satellite Navigation System, which means that location services should work almost anywhere. 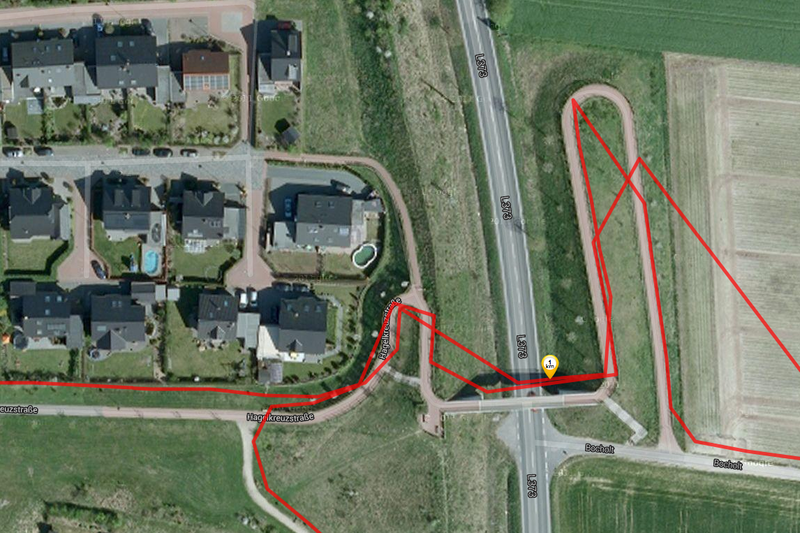 We were impressed by the GPS module in the Galaxy S4 and the the S5 continues the performance: the signal was acquired quickly and accuracy indoors was about 10 meters; outside it increased to 5 meters. 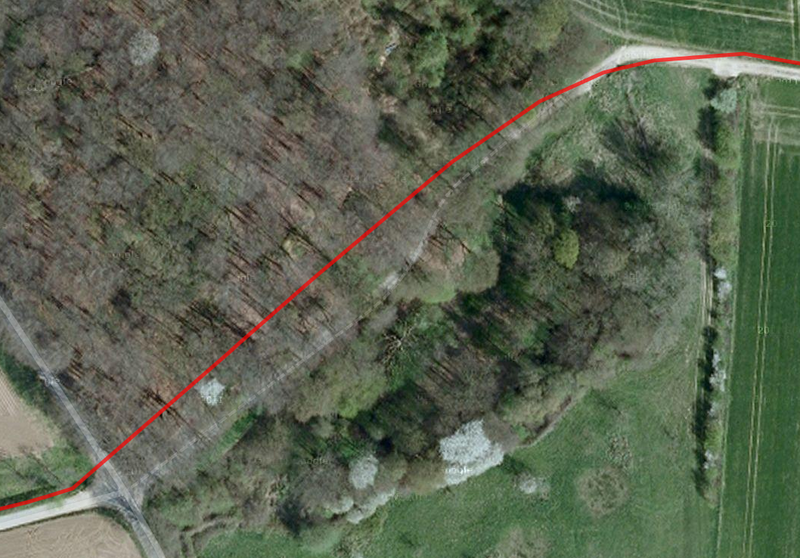 We checked the accuracy of the GPS on a mountain bike ride: compared to the professional Garmin Edge 500, the Galaxy S5 recorded only 150 meters less, which is a very good result. 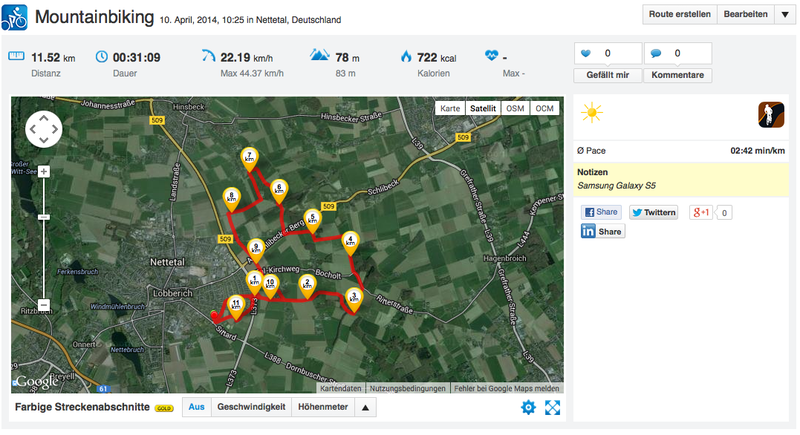 The Garmin Edge 500 is also more accurate and shows a course closer to the actual route although the accuracy of the Galaxy S5 is still acceptable. 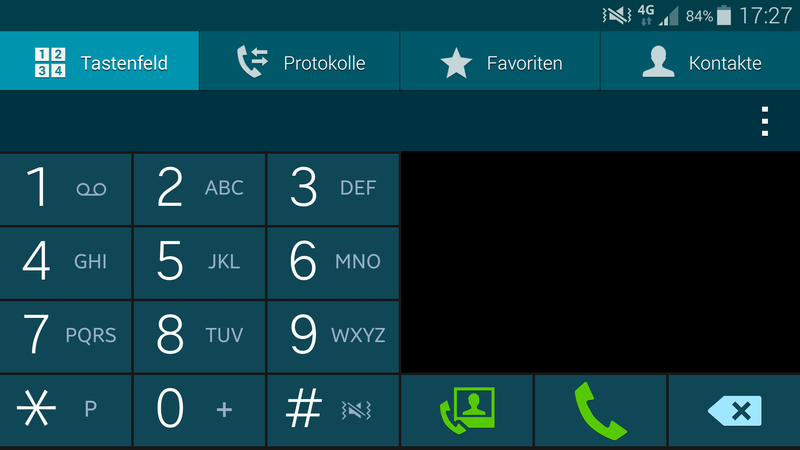 The phone application features large icons and square keys and reminds us a little of Windows Phone. There's a detailed history for each caller, which also includes messages. The number pad is very large, so even users with poor eyesight shouldn't have any issues. The app also works in landscape mode - a great feature. Favorites automatically show up under the frequent contacts. During phone calls, the voice of the partner is clear and easy to understand. The maximum volume level is also high, which makes conversations in noisy environments much easier. The person we called also attested very good sound quality. Hands-free calls using the small speaker on the back also work well; there is even an "extra volume" button, which is supposed to amplify the sound. In our fairly quiet test environment we didn't really notice much of a difference, however. The sound quality of the speaker is good, but pales in comparison to outstanding stereo speakers of the HTC One M8. 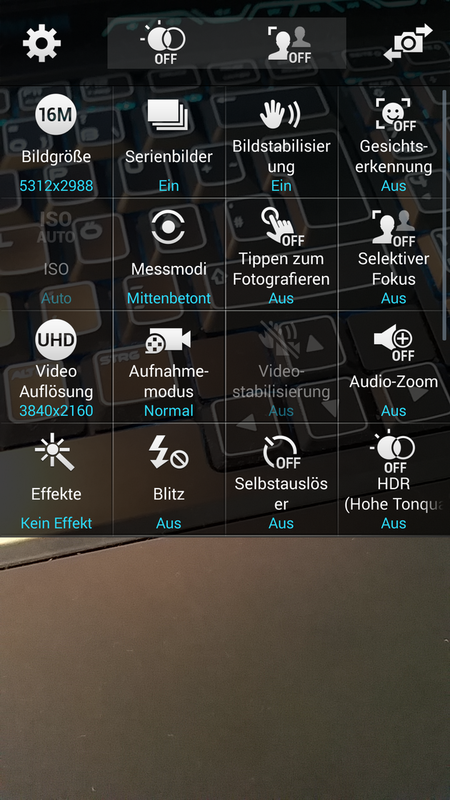 The camera application offers a lot of settings. No experiments - that's Samsung's approach for the camera as well. The new high-end HTC smartphone has the higher-resolution camera relocated to the display side to allow the user to take better selfies; the camera on the back has a lot of special effects, but suffers from fairly low resolution. 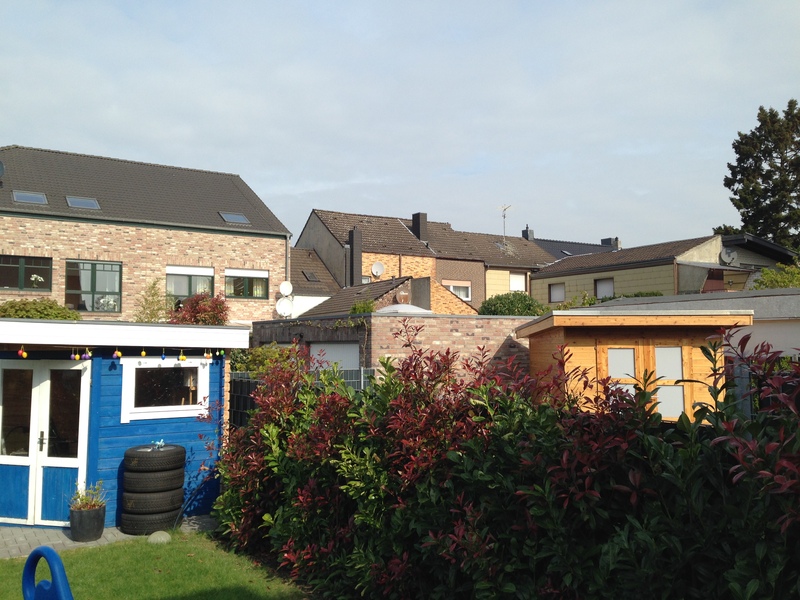 Samsung is more conservative: the back of the S5 houses a 16 Megapixel camera - 3 MP more than the predecessor. The front is home to a 2 Megapixel camera, which still supports Full-HD resolution and is easily good enough for the popular selfies. 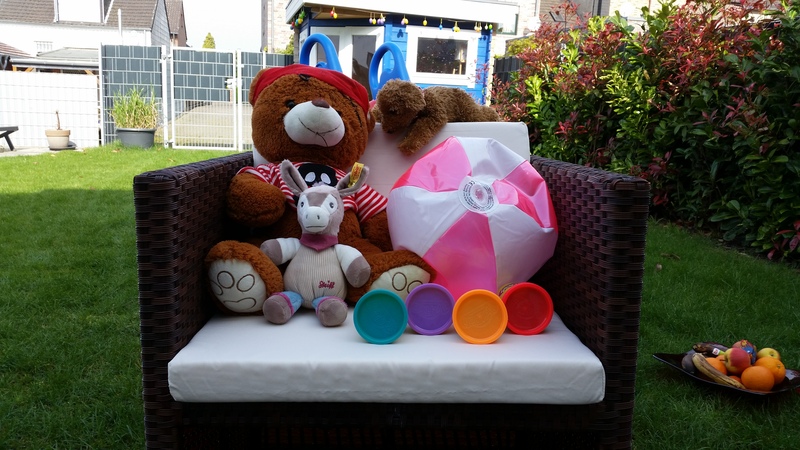 Selective Focus does what HTC touts as one of the most standout features of the One M8: the feature allows focusing on certain objects and blurring the background, which makes photos look a little more SLR-like. The camera can even do this automatically. 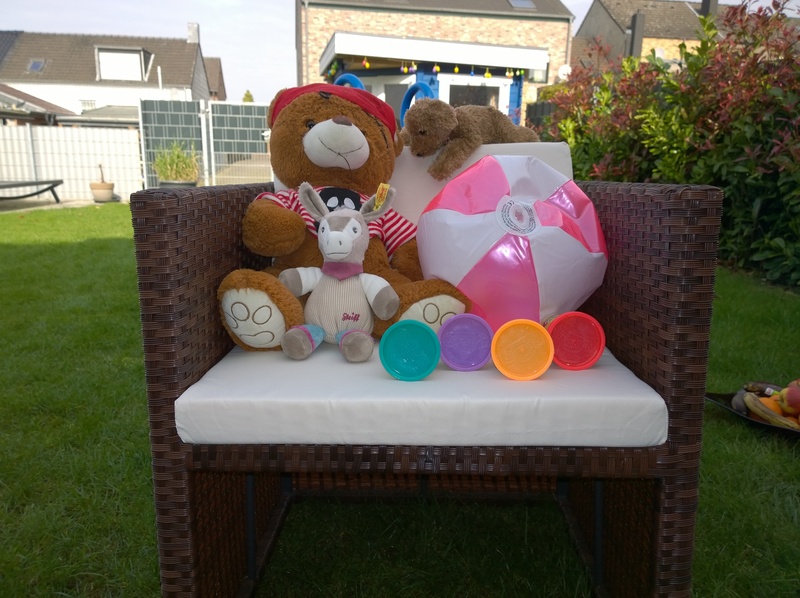 The Galaxy S5 can't do one thing the HTC One M8 does, however: the latter can shift the focus after the picture has been taken. Samsung's phone can only do that when capturing a face and then only through the software, which is less accurate. 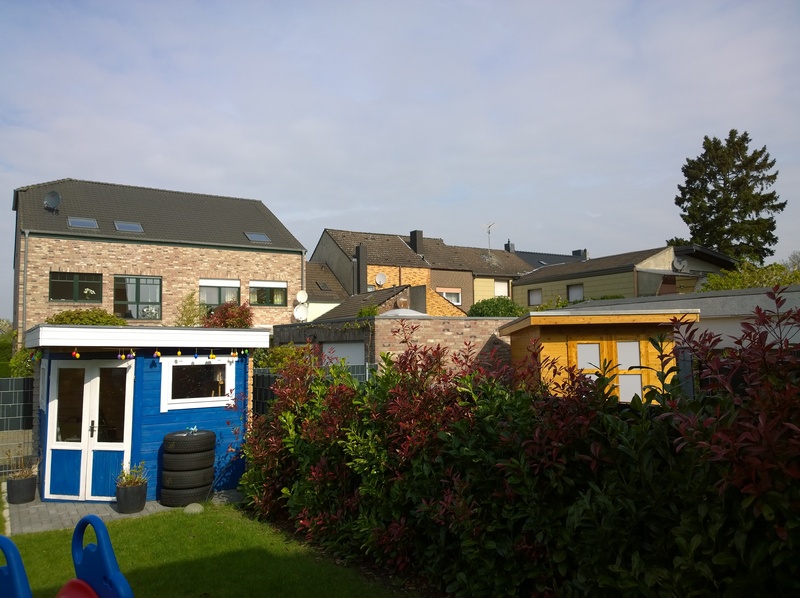 Because of the selective blurring, the perceived picture quality is very high and the photos contain a lot of detail thanks to the high resolution of the camera. Although the focus is fast and works reliably, we wouldn't quite call it "blazingly" fast, as Samsung does. Low-light conditions reveal a shortcoming: the camera frequently selects long exposure times, which can cause blurred pictures. Low-light photos also are quite grainy. 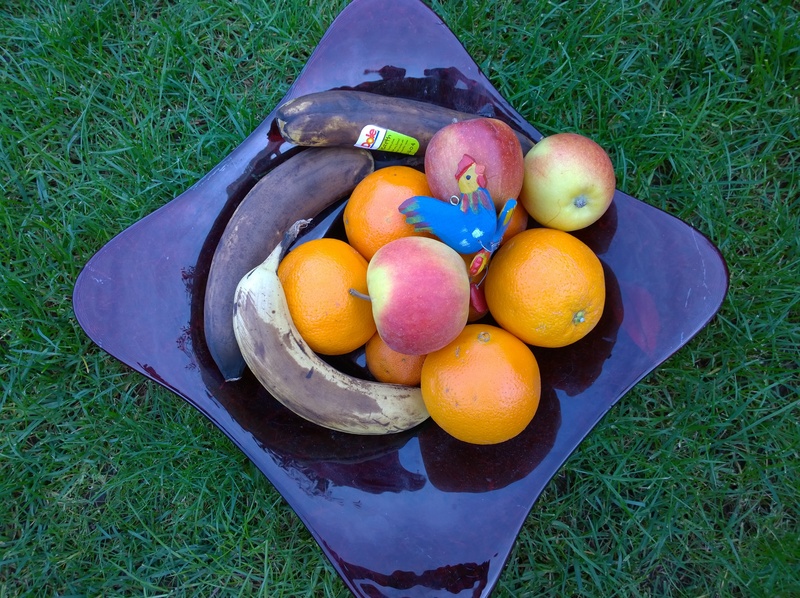 The HTC One M8 uses larger pixels, which can capture more light, and thus produces better pictures. 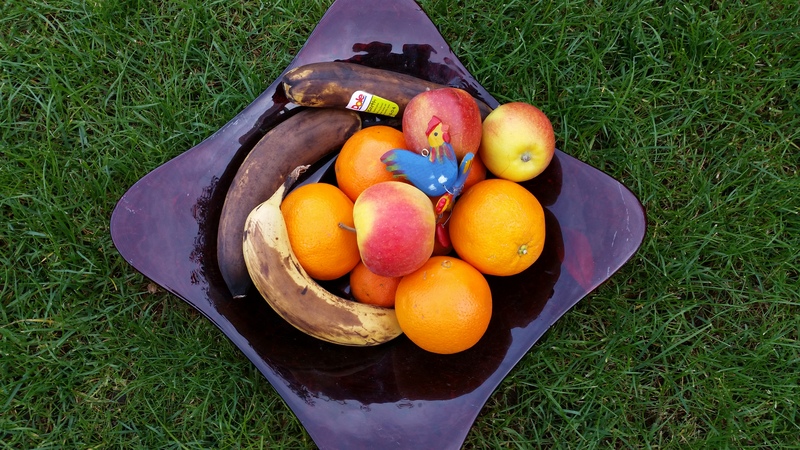 For the next generation, Samsung should probably focus on increasing the low-light performance instead of just increasing the Megapixel count - especially since the differences in the details between the Galaxy S5 (16 Megapixel) and the iPhone 5s (8 Megapixel) are not that great even when looking at crops. Samsung is proud of the fact that the Galaxy S5 can record UHD videos, the 4K successor to Full-HD, which was introduced for TVs and other media devices. Because recording takes a lot of CPU power, some features - for example capturing stills while recording - are not available. Slow motion is only possible at 720p and low-light conditions cause rather noisy videos. Under normally bright conditions, the quality and the details are pretty amazing thanks to the high resolution. The autofocus works quickly and accurately as well. We've attached a video for your viewing pleasure. Can be used as a wrist watch: the Gear Fit. As a fitness bracelet, the Gear Fit can also measure the puls or record sleeping stats. 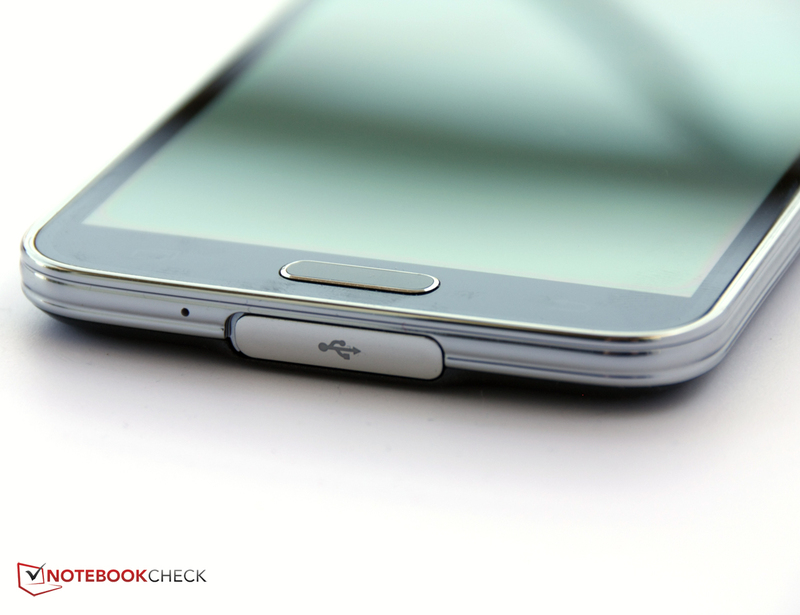 Charger, USB cable, headset, quickstart guide - the Galaxy S5 doesn't ship with a lot of noteworthy accessories. We found a few more interesting gadgets online, like the S View Cover, which has a viewing window on the front allowing the user to see see important information on the phone without opening the case. Even answering and rejecting phone calls is possible. 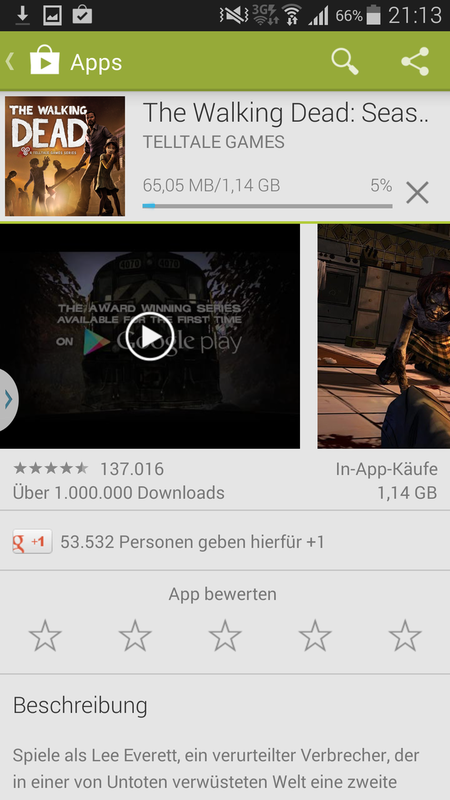 The covers sells for 49.95 Euro (~$ 70). In addition to some simple covers, chargers, and other standard accessories, there is one very special add-on, which Samsung included with our review unit: the Samsung Galaxy Gear Fit, a smartwatch with a curved AMOLED touchscreen. The screen displays colors brilliantly and is fairly readable even in bright environments. The name gives it a way: the Gear Fit focuses mostly on fitness-related features and incorporates a heart rate sensor as well as a pedometer. The wearable accessory features a pretty slick design and is not too bulky when worn on the wrist. In addition, the Gear Fit is quite light as well. The smartwatch can be used as a regular watch, although reading the time requires a push on the standby button. Only Samsung's own apps can be used; other apps are not supported. The Gear Fit doesn't have a speaker, although it does include a pager motor to alert the users to incoming calls and can also keep pace with slower or faster vibration rates. 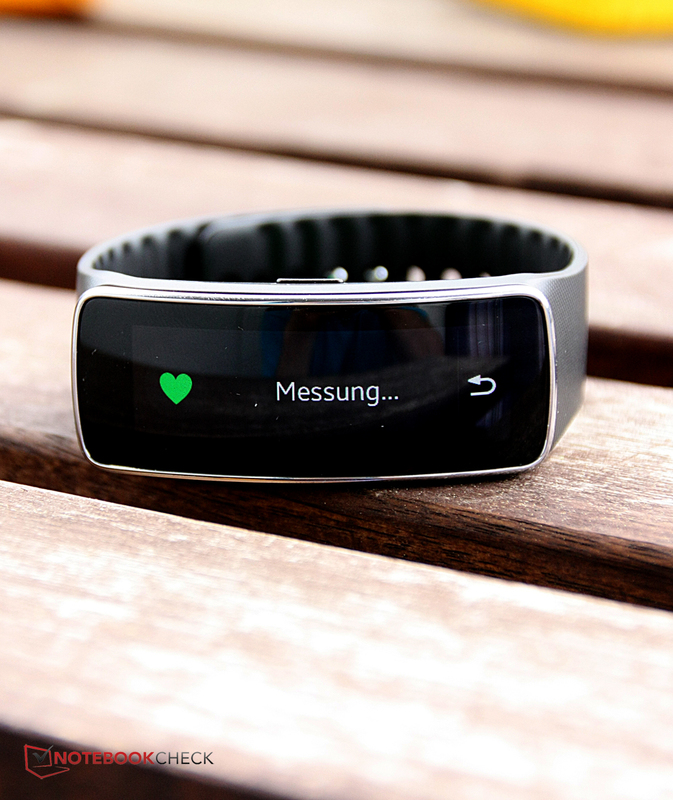 The Gear Fit lasts 2 -3 days before its battery needs to be recharged with the included charger. Users who don't use any of the fitness functions can probably squeeze a little more battery life out of it. The device can be worn with the display facing up or down on the wrist; we preferred wearing it with the display downwards since it's easier to read the display, operate the Gear Fit, and measure the heart rate more accurately. The smartwatch connects to the phone using Bluetooth and Samsung's Gear Fit Manager. 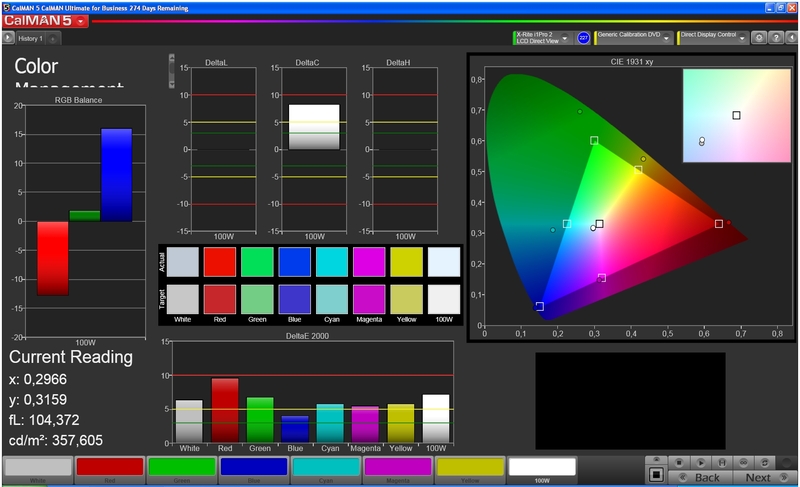 This software allows the user to change the look of the screen as well as the location of the icons. 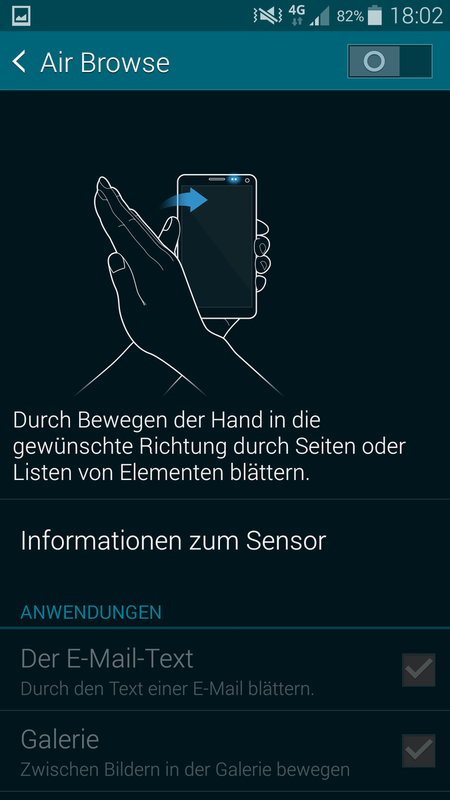 The Gear Fit is very customizable via its display as well, since the icons are large and can easily be operated with the finger. 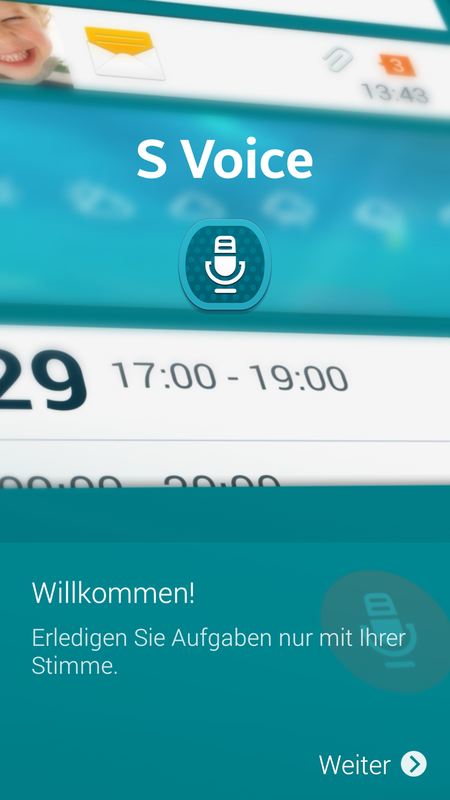 Incoming calls can be rejected on the smartwatch or answered with a preconfigured text message. Answering calls is only possible on the phone, however. 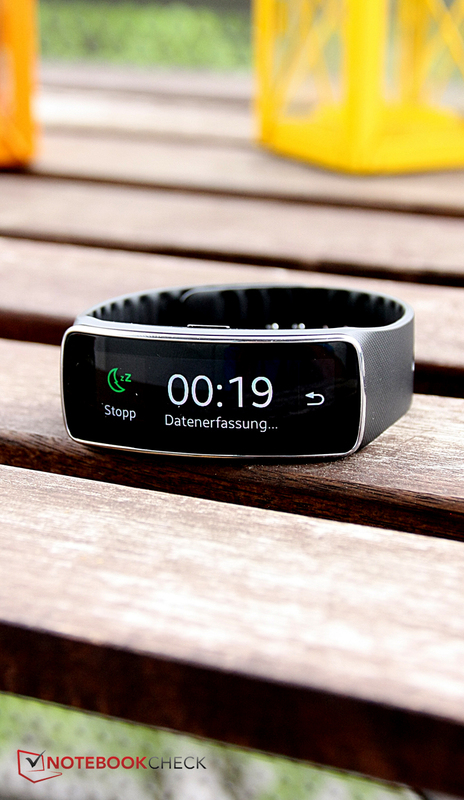 Infos and messages from various apps can be displayed on the Gear Fit if so desired. Additionally, the wearable offers basic control for media. There is no question, however, that the functionality focuses on fitness oh health: the Gear Fit can count steps, offer trainings advise, and supervise sleep. 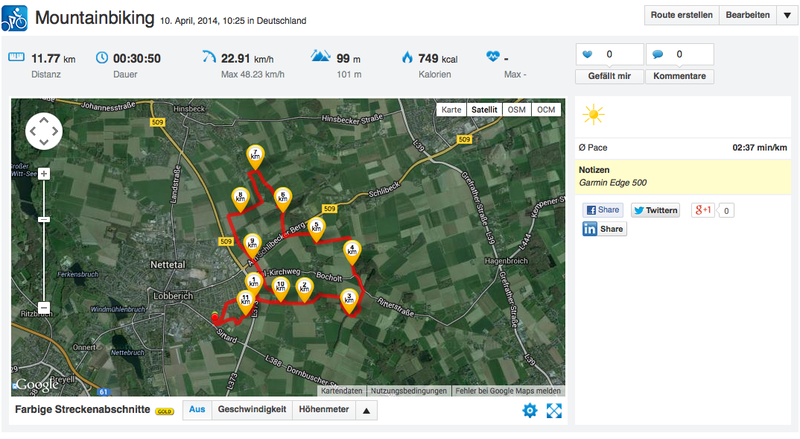 The training application displays directions (run faster / slower etc.) 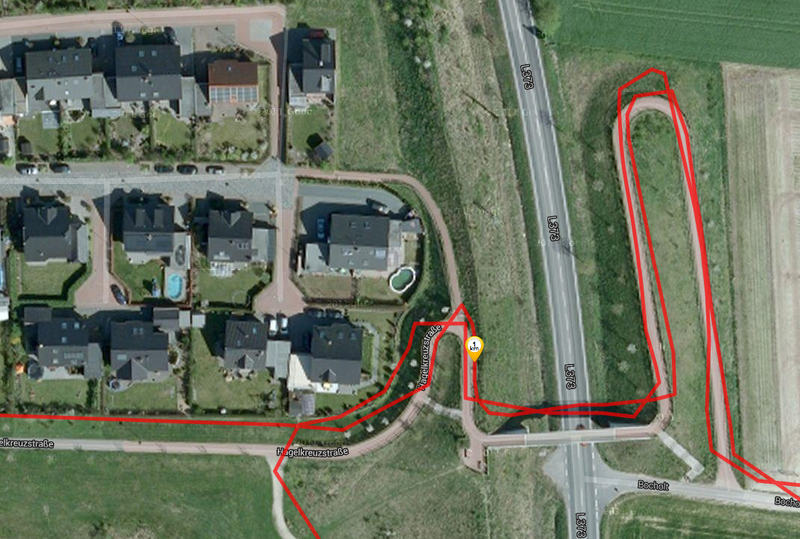 and records the run or ride distance via the smartphone's GPS. 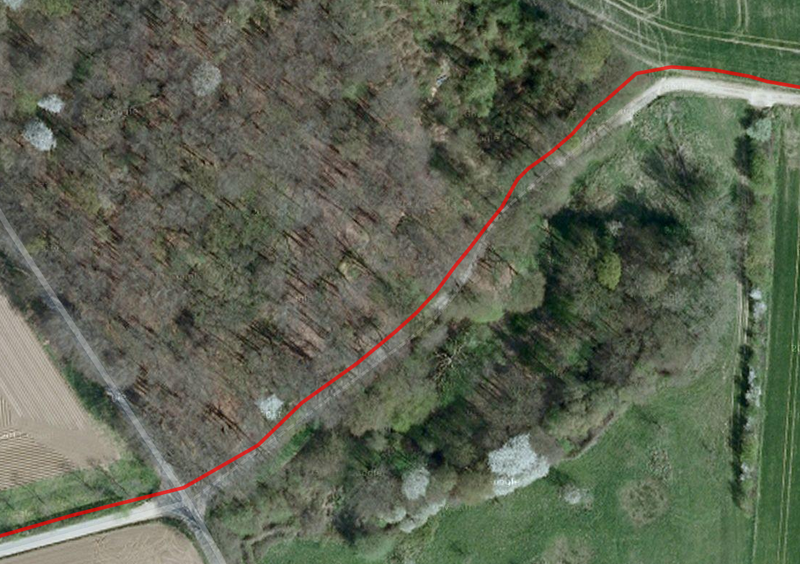 Of course that means that the smartphone needs to be taken along, otherwise the Gear Fit loses the Bluetooth connection and thus the GPS signal. 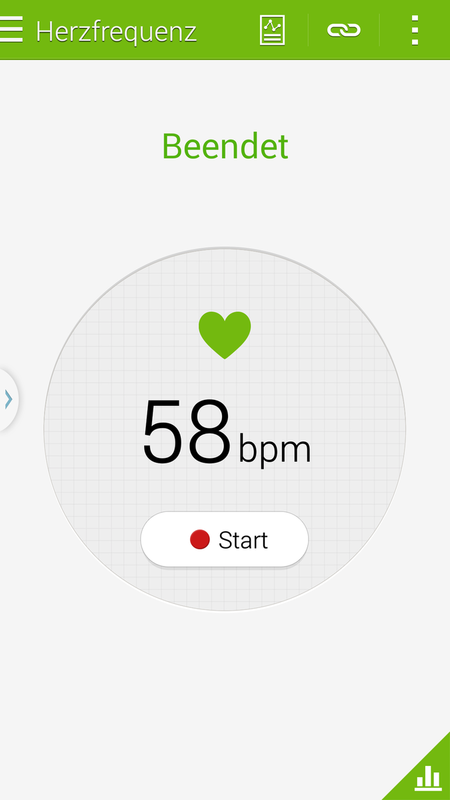 Unfortunately, since the Gear Fit only works with Samsung's S Health, other apps like Runtastic can't be used. 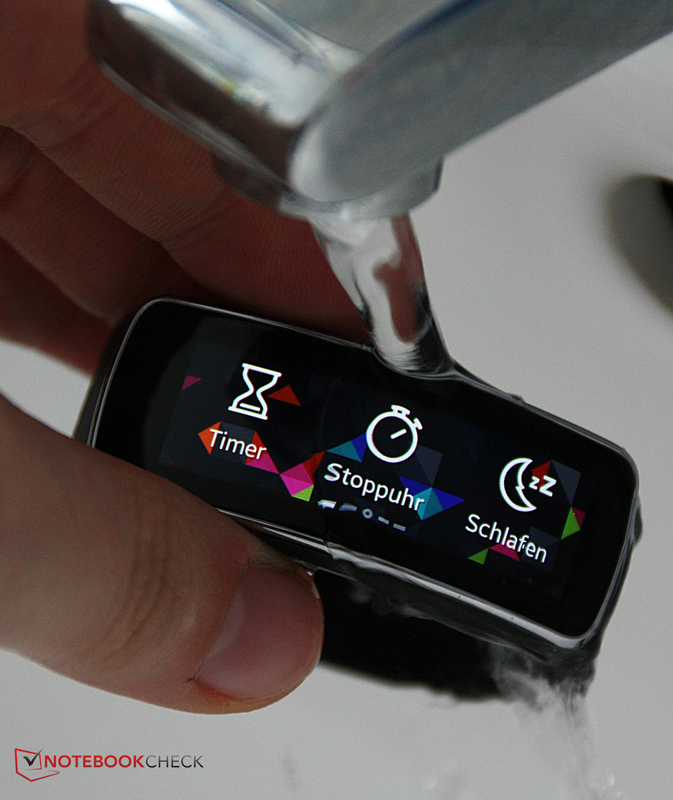 Similar to the Galaxy S5, the smartwatch is protected against dust and water, which means that the watch can be worn while taking a shower. Interchangeable color bands allow the user to customize the Gear Fit, which costs 199 Euro (~$275) and also works with the Galaxy S4, the Galaxy Note 3, and 15 additional devices in the Galaxy family. 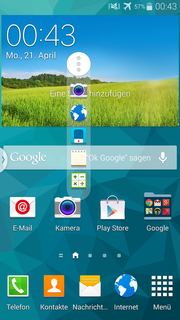 In Germany, Samsung warrants the Galaxy S5 for 24 months; the accessories and the battery are covered for 6 months. 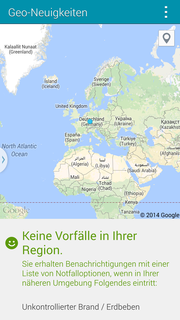 The warranty also protects the phone in other countries where the phone is available. 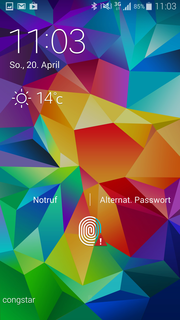 Just like the Galaxy S4's, the 10-finger touchscreen of the Galaxy S5 is a pleasure to use. Sensitivity extends to all the corners and the input is very precise. 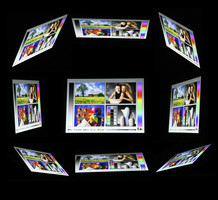 Multitouch gestures like zooming or rotating are recognized reliably as well. 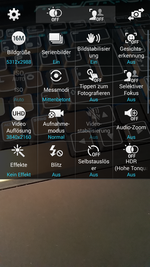 The already familiar Galaxy S4 gestures to capture a screenshot (sliding the side of the hand over the display) or stopping of media playback (covering the display), are supported again as well. During winter, a high-sensitivity mode allows the operation of the display with thin gloves. The keyboard we are also quite familiar with, since it's used on other Samsung models. We quite like it, as there are a multitude of configuration options and input choices, ranging from voice and swipe input to hand writing recognition. 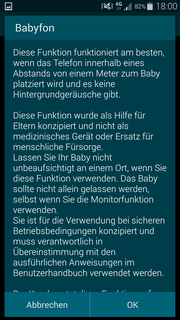 Frequently used words can be assigned to the number keys; the layout can accept the German Umlaute if so desired, and the delay time and other features are all adjustable. The function to "automatically replace" incorrect words we liked much less, as words we had typed correctly frequently were replaced with wrong ones the system was familiar with. At least it only takes a few steps to turn this function off. Even though the keys appear to be quite small at first, there is plenty of distance between them and typing works very well. Suggestions allow the user to input long words quickly. 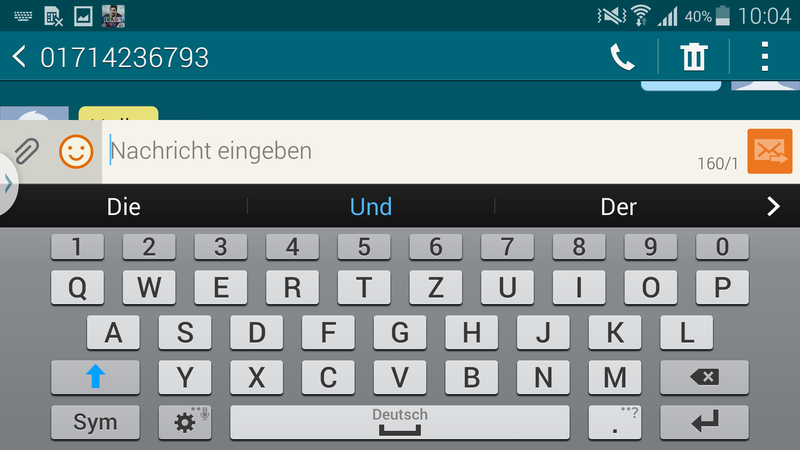 Overall, the keyboard seems a bit neater and better organized than the keyboard of the HTC One M8. 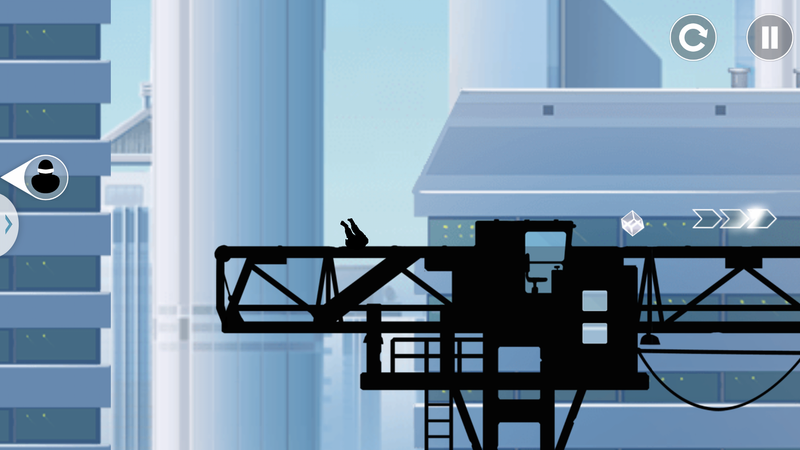 We were able to type quickly and reliably both in portrait and landscape mode. The Korean company must have not found their Smart Scroll feature to be that worthwhile, as it is now hidden deep inside the menu structure. That same menu also has options for people with disabilities - for example magnification or blinking lights instead of acoustic signals. Users familiar with Samsung's SAMOLED technology already know what to expect: a display with Full-HD resolution, colors that pop, and excellent black value and contrast. The Galaxy S5 picks up where the other family members left off and its screen is now even brighter than the Galaxy S4's (364 cd/m² vs. 300 cd/m²). At 82 %, the brightness distribution is somewhat uneven, but we couldn't really discern any differences in brightness even when looking at larger areas with solid colors. 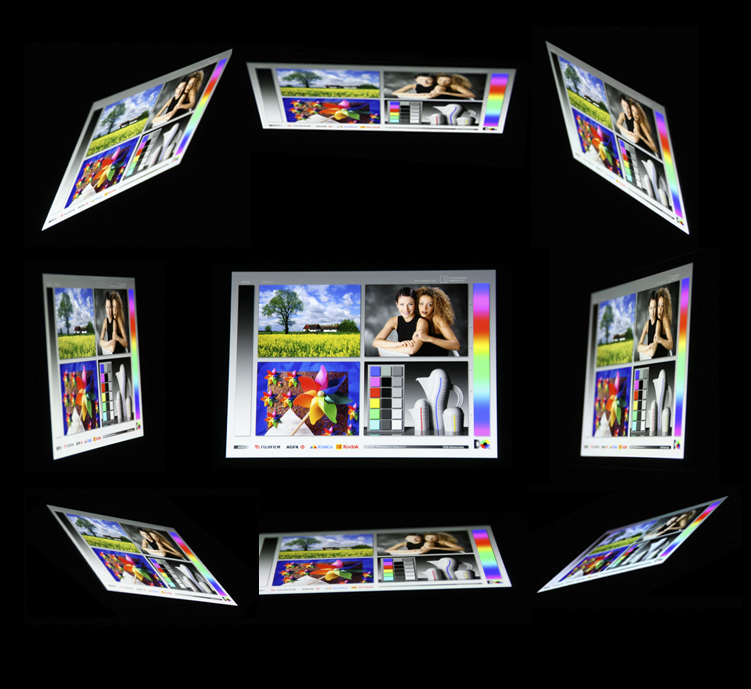 The display is too bright for most environments and just 10 % of the maximum brightness are sufficient for working inside. 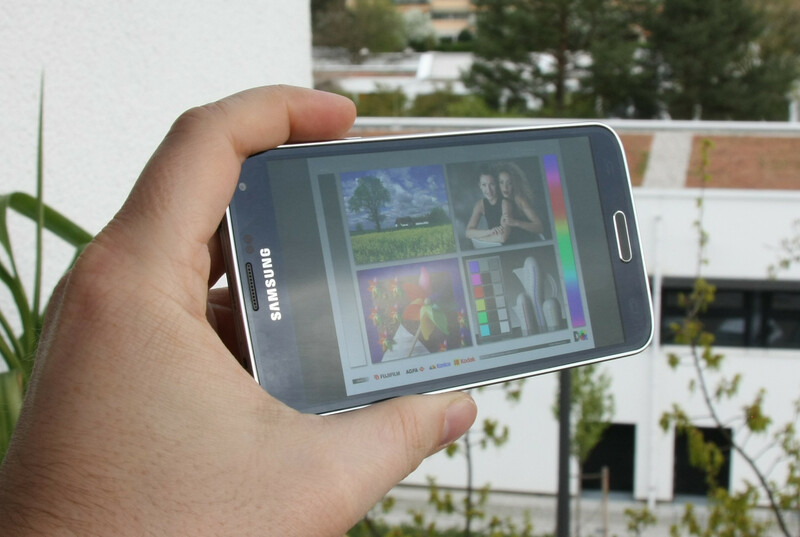 When we reviewed the Galaxy S4, we couldn't measure the black value since black areas don't emit any light whatsoever. That also means that the contrast is too high to measure. 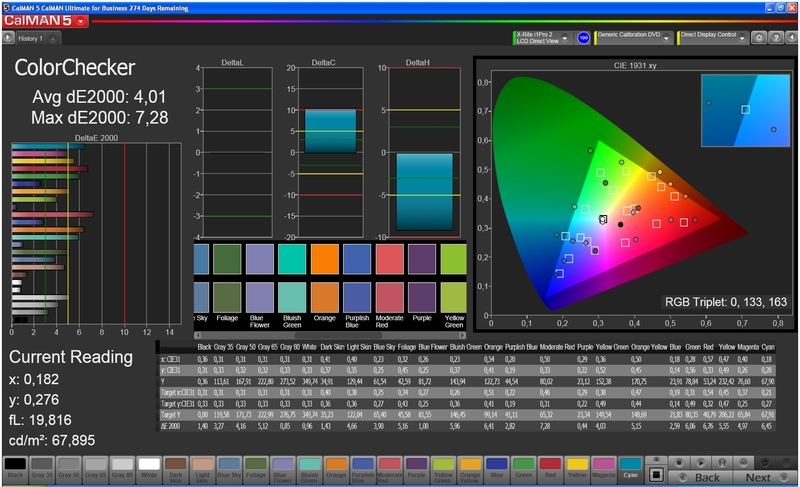 Because of the very high brightness and the infinite contrast, the colors are extremely vivid. 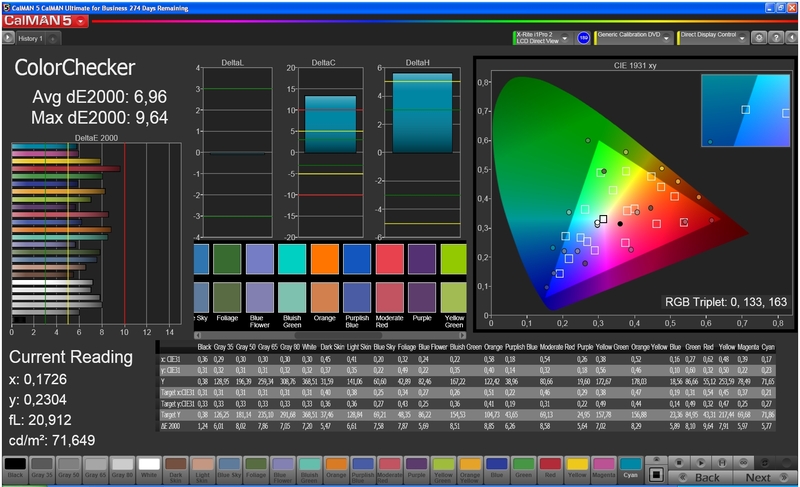 Users who prefer more subdued colors can adjust the display mode and pick a different profile. Movie Mode appeared to have the most natural colors, Dynamic Mode looks a little artificial, but the contents of the screen are quite vivid. 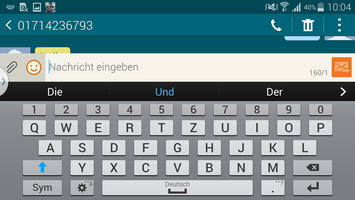 Adaptive Mode automatically picks a profile according to the application. 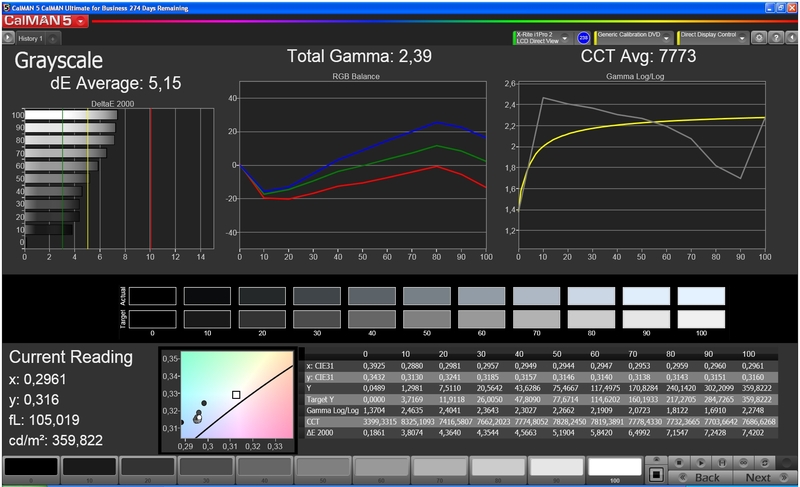 Our in-depth test with CalMan and a colorimeter reveals that the different profiles do make quite a difference. Although the color management doesn't fundamentally change (blue colors are emphasized in favor of red ones), the levels are adjusted accordingly. The Movie Mode offers the most accurate representation of colors compared to sRGB. The same is true for the graylevels; the largest deviation for both we recorded in Dynamic Mode. Blue colors are undersaturated, so there is no bluish hue. 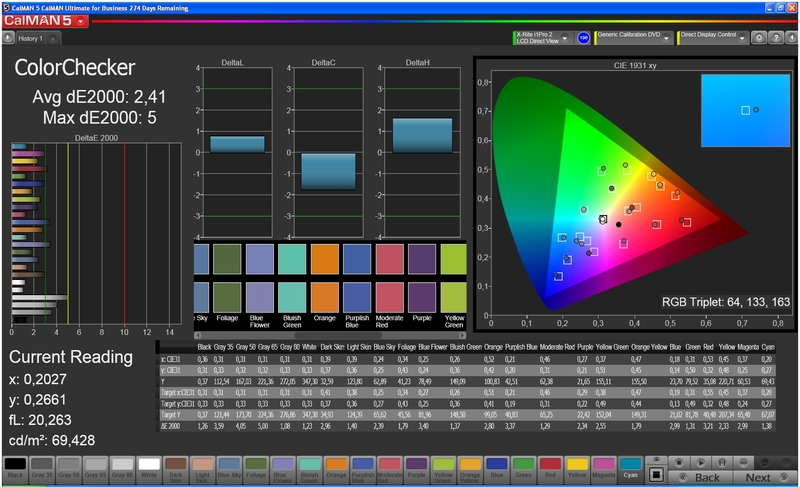 Green tones are slightly oversaturated in Movie Mode and closest to their reference values. The high brightness and contrast increase outdoor usability. Direct sunlight is best avoided, as it gets harder to decipher the display content because of the reflective nature of the display. On cloudy days or in the shade we had no issues with the readability at all. 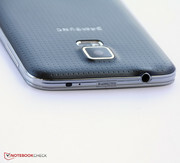 "Perfect" - this is how we summed up the viewing angle stability during our review of the Galaxy S4 almost a year ago. 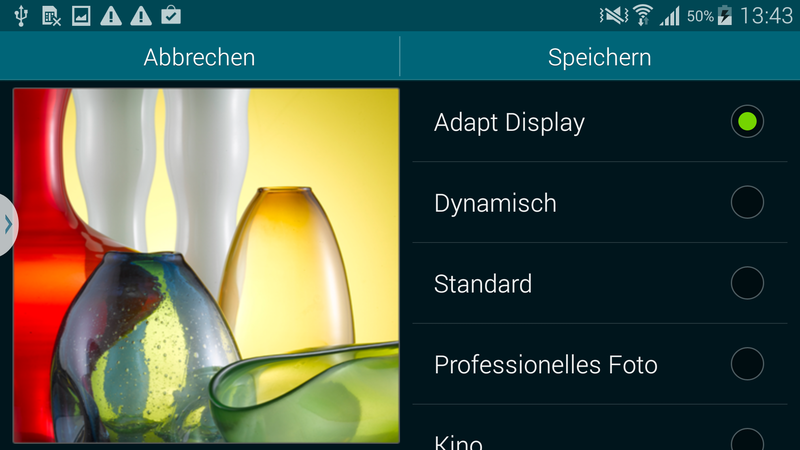 We can't really add much here: the display of the Galaxy S5 remains readable even at the most extreme angles and neither brightness nor contrast decrease at all. With the Qualcomm Snapdragon 801 MSM8974AC, Samsung incorporates one of the newest SoCs. Its main advantages compared to the series 800 are the increased efficiency as well as increased performance. The naming convention indicates that the new SoC can be considered an intermediate step. The m HTC One M8 comes with the same SoC but with a lower clock rate (2.3 GHz). The 2.45 GHz quad-core SoC offers more than enough performance for all current applications as well as multitasking, which the TouchWiz interface supports as well. During our time with the smartphone, we never encountered any lags or stutters. We also appreciate that the Galaxy S5 doesn't have to resort to cheat like HTC did with the One M8 to improve the tst scores during - at least neither we nor our colleagues from Anandtech could find any signs of manipulated firmware. 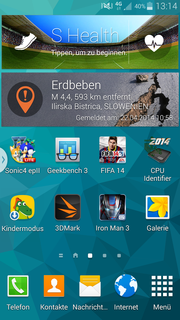 The Galaxy S5 is one of the fastest smartphones simply because they system is well optimized and uses a fast SoC. Only the iPhone 5s is faster still. The Adreno 330 is the GPU component of the SoC. 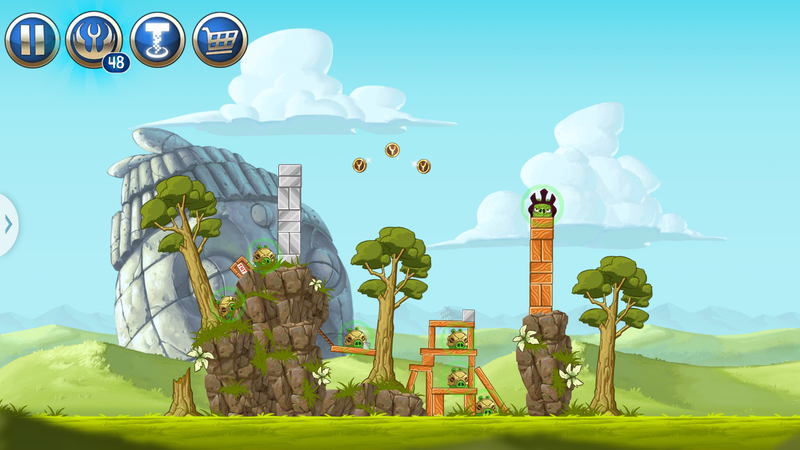 With a clock rate of 578 MHz, the graphics unit supports even the most demanding games in the Google Play Store. For 3D calculations, even the iPhone 5s can't always maintain first place and succumbs to the Galaxy S5 in several areas. The HTC One M8 trails between 4 % and 37 % depending on the benchmark because of its slower clock speed. Web browsing is very easy and quick. Because of the large display and the high resolution, websites are easy to view and the accurate touchscreen works well to operate smaller buttons and links. 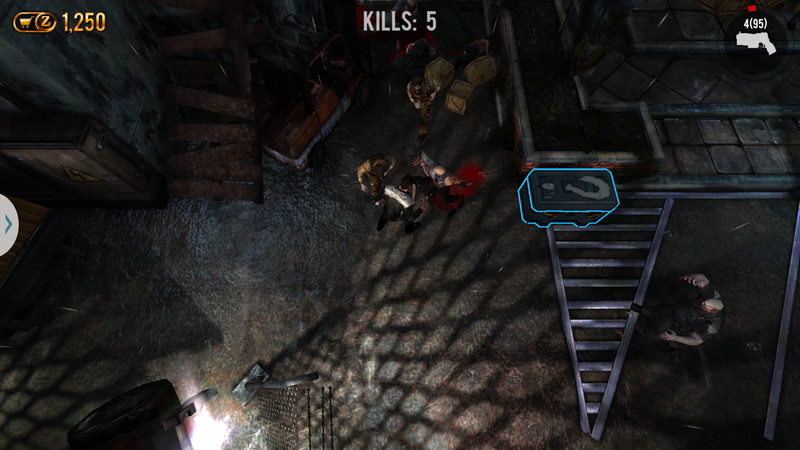 The scrolling performance is also impressive, as operation is stutter-free and the rendering very quick. The various benchmark show the Galaxy S5 to be an impressive performer at the top of the pack. The speed of the integrated flash - our review model features 16 GByte - is also top notch, although somewhat restricted: Samsung optimized the storage for better sequential read and write performance. Compared to the Galaxy S4, performance has increased significantly, although the HTC One M8 is faster still. 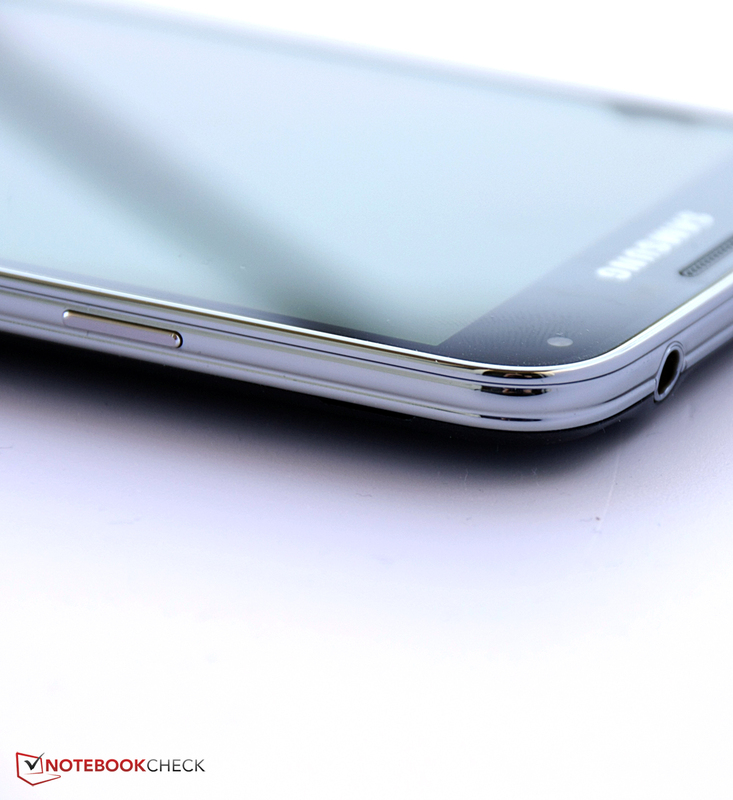 For random reads and writes, however, the Galaxy S5 scores behind its competitors. This can be especially noticeable when the files are not sequential, but stored in many different areas (fragmentation). We already alluded to the fact that the Adreno 330 is fast enough for all the games available in the Play Store. It doesn't matter if it is a casual game like Clash of Clans or Angry Birds: Star Wars 2, a classic game like GTA: Liberty City, or demanding 3D game like Iron Man 3: gamers are going to be completely satisfied with the performance of the Galaxy S5. The accurate touchscreen and the position sensor allow for precise control during game play. The large screen also helps, since the buttons are large enough and the high resolution and the brilliant colors do their part as well to make the virtual worlds look good. 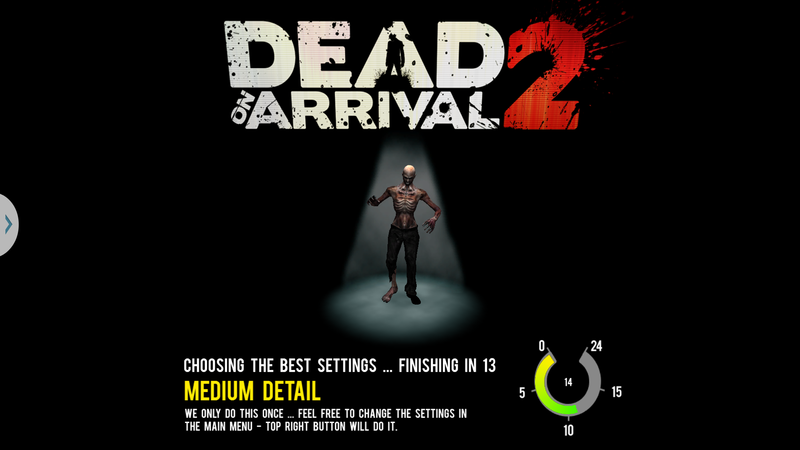 ... or the demanding 3D game "Dead on Arrival 2". While the Galaxy S4 did quite well when as far as surface temperatures are concerned, the Galaxy S5 stays even cooler with average temperature measurements that are 3 to 4 degrees C lower on the front and back. Under load, we recorded a maximum of 37.7 degrees C; the predecessor reached 42.5 degrees C.
During idle, the Galaxy S5 more or less doesn't heat up at all: 27.3 degrees C are hardly noticeable. The Galaxy S4 reached 34.1 degrees C - almost 7 degrees more. The Samsung Galaxy S5 is one of the coolest running smartphones out there: Apples iPhone 5s topped out at 39.5 degrees C and is also not as cool during idle and the HTC One M8 can't quite match the performance of the S5 in this area, either. Kudos to Samsung! (±) The average temperature for the upper side under maximal load is 34.9 °C / 95 F, compared to the average of 33.1 °C / 92 F for the devices in the class Smartphone. (+) In idle usage, the average temperature for the upper side is 26.6 °C / 80 F, compared to the device average of 33.1 °C / 92 F.
Good, but compared to the One M8 a bit tinny: the single speaker. We might be a bit spoiled since listening to the HTC One M8's excellent stereo loudspeakers. Although the single speaker of the Galaxy S5 offers a decent sound stage, is sufficiently loud, and doesn't distort at high volume levels, it still just sounds like a regular smarthphone speaker. HTC's stereo speakers bring some warmth to the sound, while the Galaxy S5 sounds more tinny and not quite as present. For a smartphone, the sound quality is still OK, but HTC definitely set a new standard. Unlike the HTC One M8, which didn't improve upon its battery life compared to the predecessor, the Galaxy S5 is more efficient than the S4. One one hand, Samsung reduced the power consumption of the display, on the other, the 28nm Snapdragon 801-series SoC is more efficient than the 800-series. 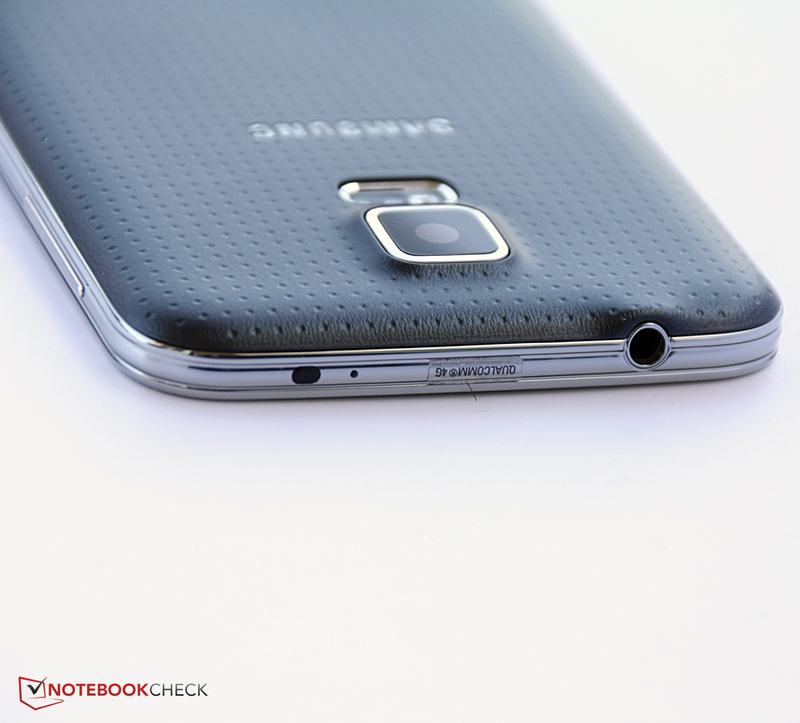 During idle, the S5 now requires only 0.5 watts compared to the Galaxy S4's 0.8 watts. The HTC One M8 needs 1.4 watts under the same conditions. Under maximum load, the Galaxy S5 consumes a bit more than the predecessor with 6.2 watts. The average under load remains about the same at 3.1 watts. The battery can supply 10.78 Wh and is physically larger in addition to offering more capacity. 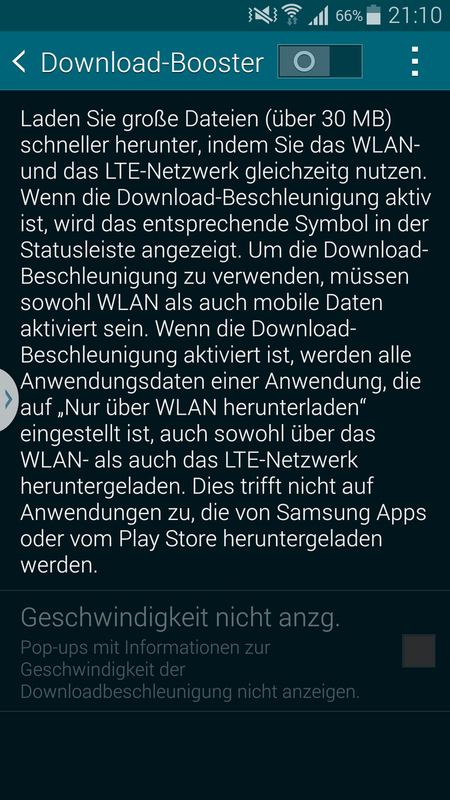 The runt times have improved: WLAN surfing is now possible for 10 hours and 13 minutes - an improvement of one hour. The S5 even beats out the iPhone 5s. Under load, the smartphone lasted 4 hours and 13 minutes before shutting down. This result is an improvement over the predecessor and beats out most competitors. During normal use, the Galaxy S5 showed good stamina: with the occasional game, one to two longer phone calls per day, and the usual WhatsApp and SMS messages, the Galaxy S5 required recharging every two to three days. The HTC One M8 features an Extreme Power Saving Mode, which ekes out another couple ours of standby time even when the battery is almost depleted. This is a very useful feature in case one has to be available for a few hours, but recharging the phone is not an option. Samsung offers two energy-savings modes: the normal one reduces background activity and reduces performance and can also change the display output to black and white only, id so desired. The Ultra Power Saving Mode is more aggressive: in addition to a black and white display, only certain apps can be opened. The net result: even with a capacity of 1 % (! 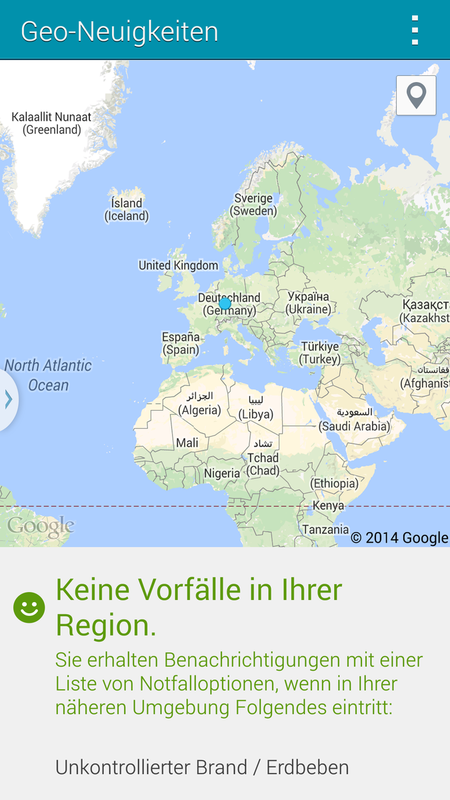 ), the phone lasts another 3 hours. We really liked the fact that the Samsung Galaxy S5 can be used again rather quickly when the battery is completely depleted: once we connected the smartphone, we were able to use it again in a few seconds. Charging the smartphone takes less than two hours. The launch of the Next Generation - what has changed in the realm of smartphones in one year? Nothing fundamental, that's for sure. Case in point: the Samsung Galaxy S5, which is a very decent evolution, but not a revolution. Better temperature management, a more frugal processor with more performance, a better battery life, and a better camera: Samsung improved a lot of details. 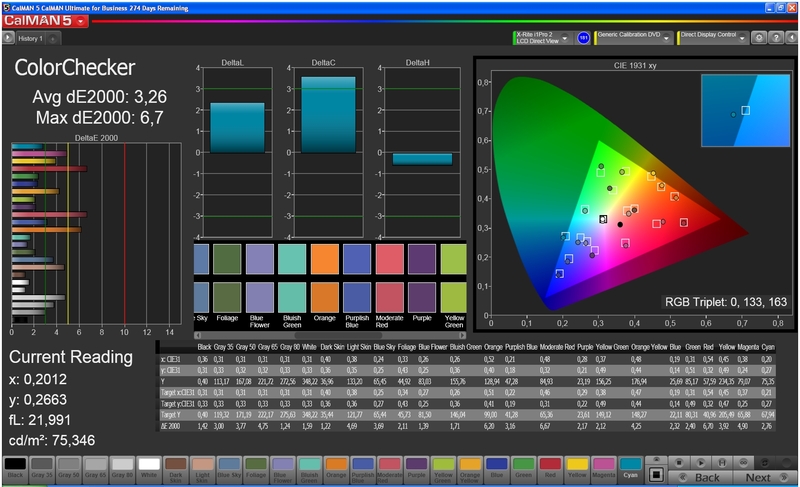 Noteworthy is the display, which is even brighter now with more brilliant colors. The software and the many different modes of operation are unmatched. The Galaxy S5 supports most networks, almost all GPS satellite systems, and offers connectivity to the outside world through numerous channels, while ensuring good signal strength in the process. The display is extraordinary and the camera captures detailed images with interesting background blur effects. We can't find much to complain about: all settings are explained well enough so even beginners will feel comfortable rather quickly. While the case doesn't look quite as upscale as the one HTC uses for the One M8, it is dust and water resistant. 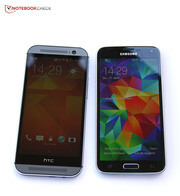 The speaker system pales in comparison to HTC's implementation, however. Serviceability is pretty mediocre as well, but at least the battery can be swapped out. The size of the S5 makes using the fingerprint sensor not that easy, while the heart rate sensor is a neat idea, but not much more for probably 80 % of the potential user base. The Gear Fit is also a nice gadget, but we can't quite decide if it is a fitness device or a smartwatch and it's too expensive in our opinion at 199 Euro (~$275). The strongest competitor comes from within: the Galaxy S4 does many things as well as the successor and can be found online for about 350 Euro (~$480). Considering the fairly insignificant differences, the question is if the Galaxy S4, which costs 200 Euro (~$275) less, isn't the smarter choice. Those who own the S4 don't necessarily need to upgrade. 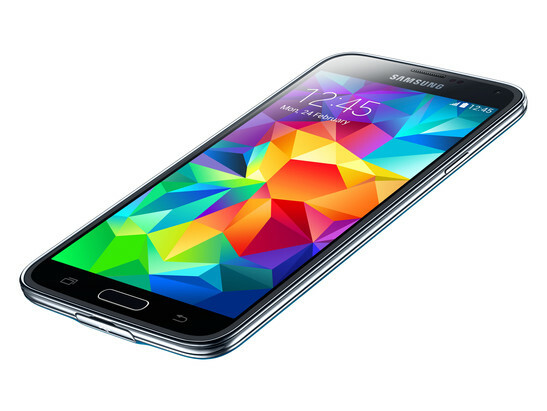 Users in the market for a high-end smartphone should definitely take a good look at the Galaxy S5. The feature set is simply outstanding - even weeks down the line, the user might stumble upon new and useful features. Operation is extremely intuitive and doesn't overwhelm the operator. Samsung does an outstanding job balancing both features and functionality. During the rating process, we awarded the Galaxy S5 an extra point for the exemplary and well-explained software, the short recharge times and the high battery capacity. We recommend the Galaxy S5 to users looking for a multitude of configuration options, the newest hardware, and a water resistant case design. 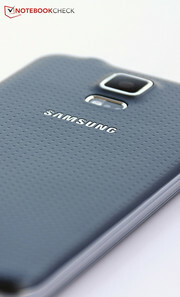 Potential buyers who only use the basic smartphone features are probably better off with the Galaxy S4. Either way - Samsung's Galaxy S undoubtedly will please many earth-bound users. 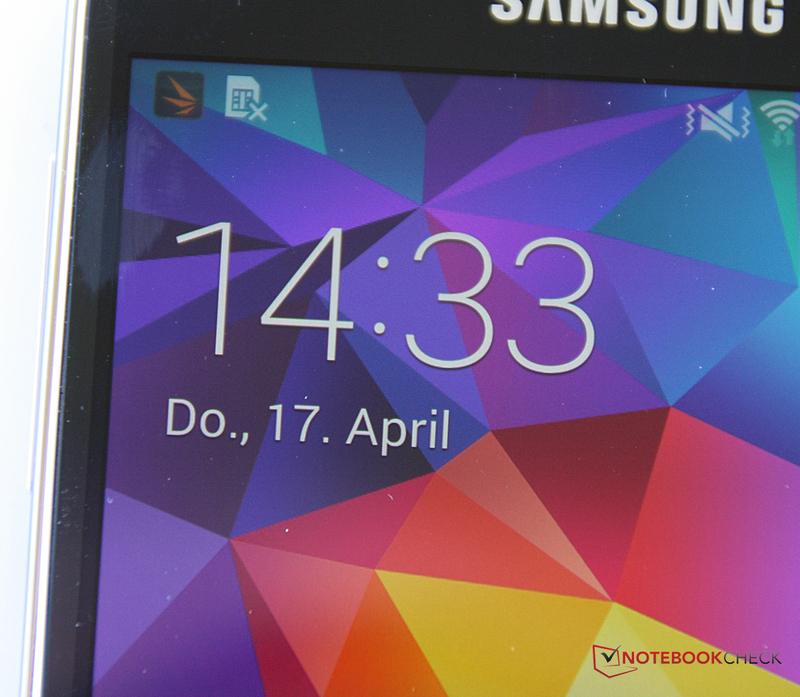 In Review: Samsung Galaxy S5, courtesy of Samsung Germany. In Review: Samsung Galaxy S5. 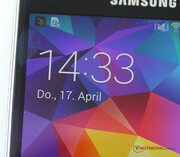 Test model courtesy of Samsung Germany. 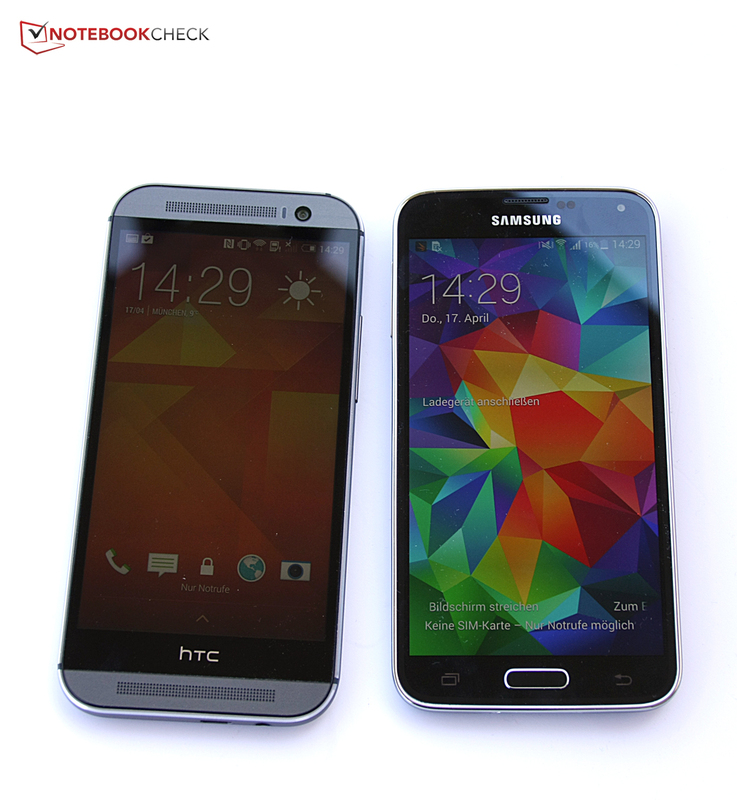 Direct comparison: the HTC One M8 wins out with its case design, the Galaxy S5 scores with its display. 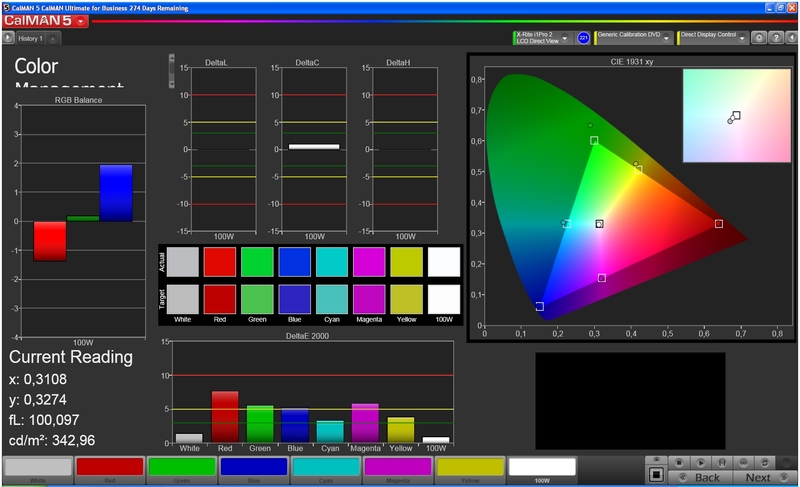 The brilliant sceen features Full-HD resolution. 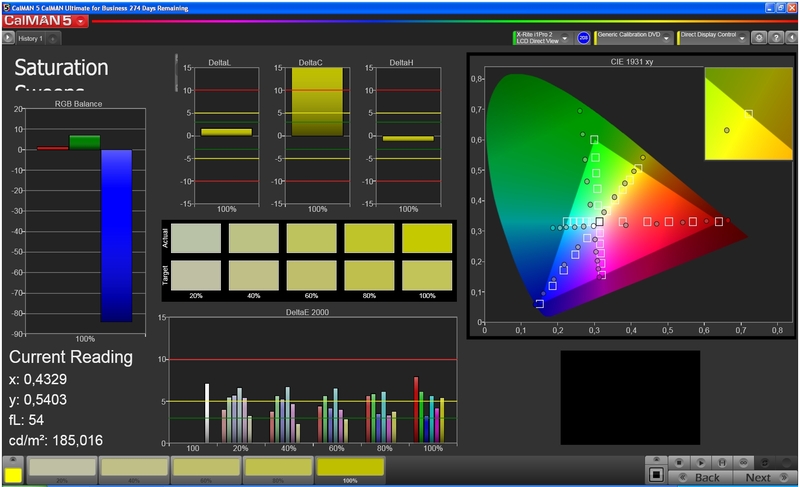 Users looking for more natural colors can change the settings. The case has been improved and is now resistant to dust and water. All openings are protected with covers. The test under water revealed no issues. We also like the selection of optional accessories. The Samsung Galaxy S5 is easy to hold, torsionally not quite as rigid, and doesn't feel quite as upscale as HTC's new high-end smartphone. 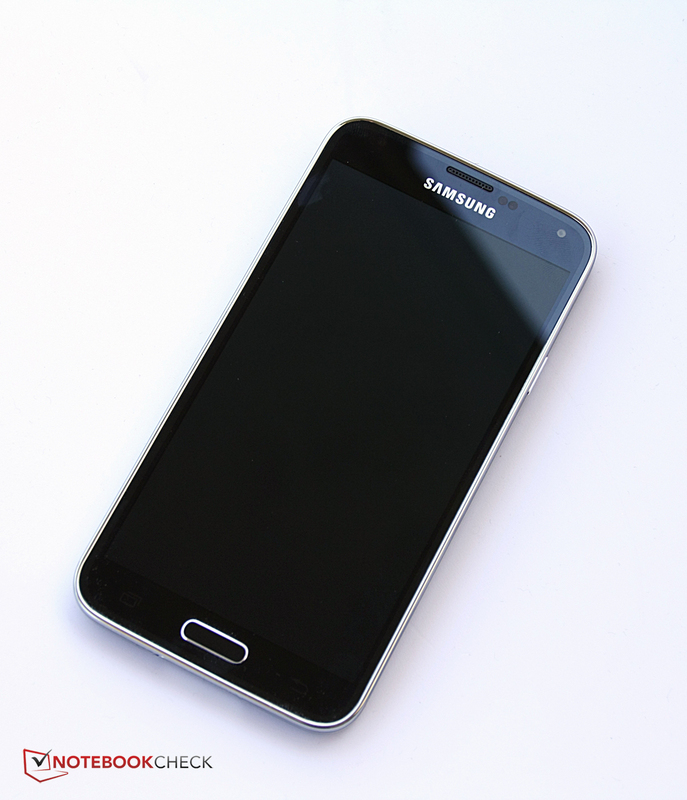 Compared to the Galaxy S4, the new smartphone is slightly thicker and heavier. The camera captures a lot of details and can handle UHD videos. The performance in low light is not that great, however. 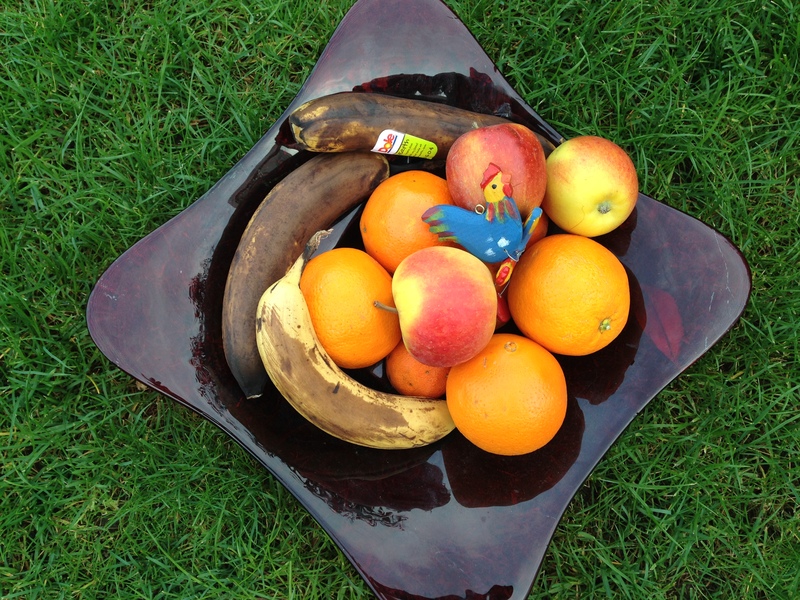 16 Megapixel is not everything - sometimes, larger pixels are better. The speaker is decent, but can't compete with the stereo speakers of ONE M8. An LED above the screen notifies the user when new messages arrive and about the charge level. 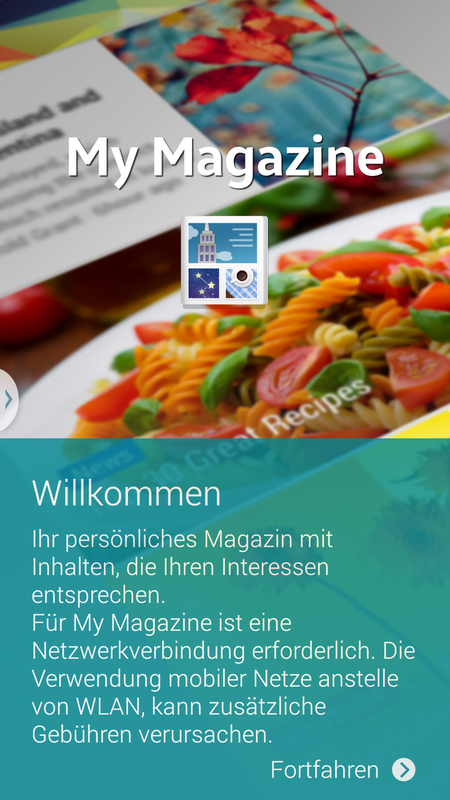 The new "My Magazine" app reminds us of HTC's "Blinkfeed". 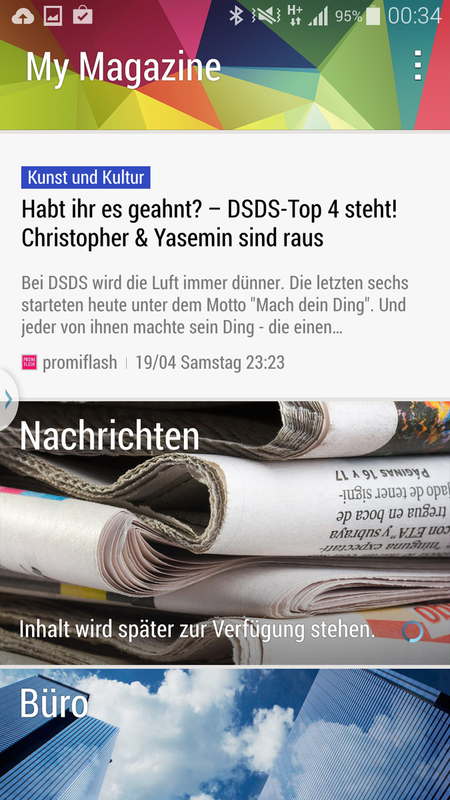 The app combines infos, news, and social media alrets - although HTC's version is more comprehensive. 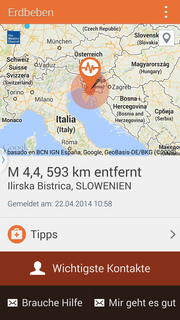 Natural disasters might not be that common in Central Europe, but Samsung provides an app that warns the user. 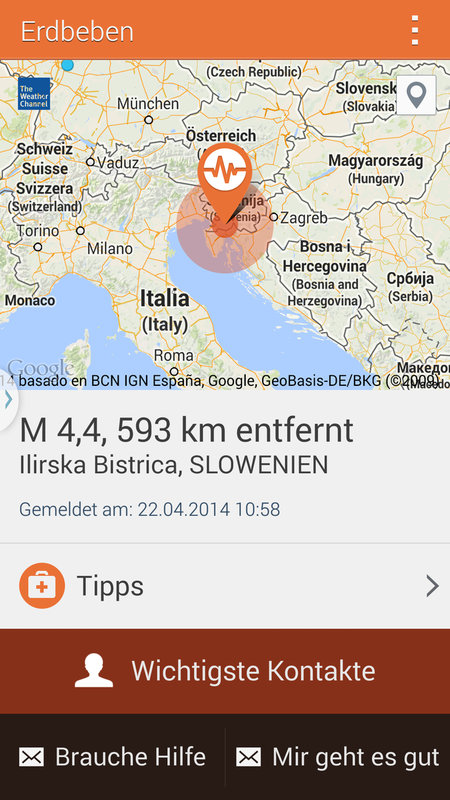 Apparently, there was an earthquake only 600 kilometers away. 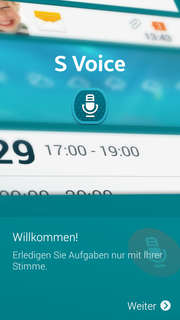 The app has many options - for example, to alert important contacts with a simple push of a button. Disaster notification in style: the message on the home screen. 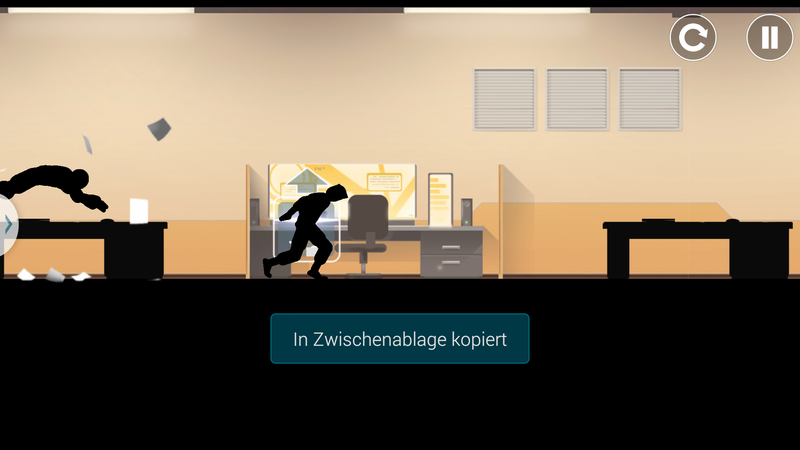 In case of an emergency, pressing the standby key three times will send a message to important contacts - with photo and geodata, if so desired. 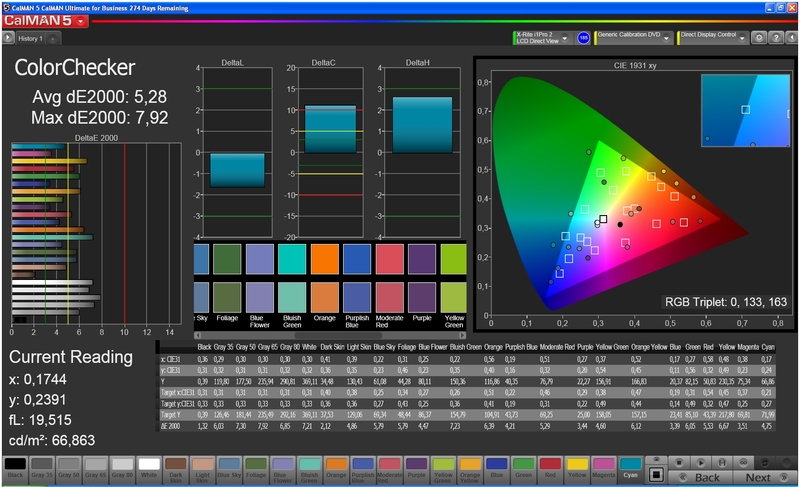 Samsung ultilizes a colorful design to accentuate the display's brilliant color reproduction. There are plenty of additonal enhancements like multi-tasking or the toolbox shown here, which can be positoned freely on the home screen. 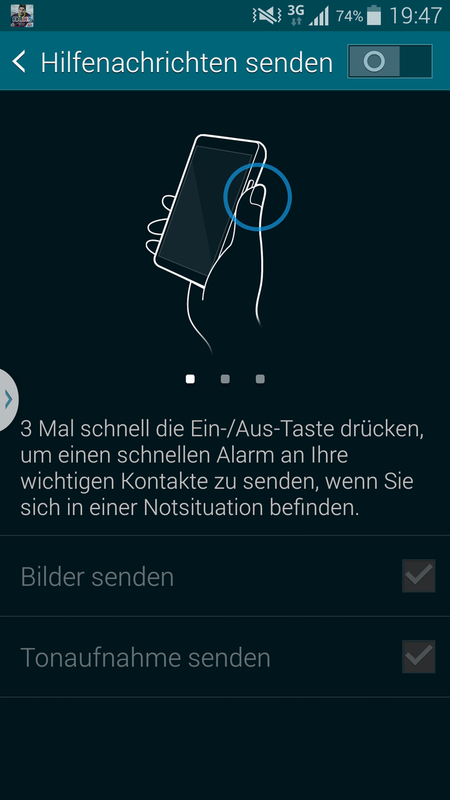 New: the finger print reader allows the user to unlock his or her smartphone. This works fairly well, but because of the size and the fact that the sensor works in one direction only, operation can be a bit cumbersome. On the back: a heart rate sensor, which works quite well. 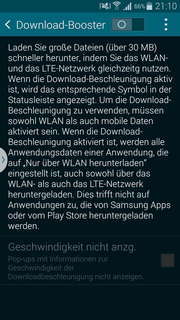 Also new: the Download Booster, which combines LTE and WLAN to allow for faster download speeds. This works very well. The little flash sympol in the info bar alerts that the mode is active. 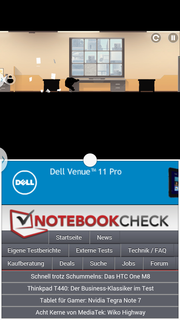 The phone app looks a little like Windows Phone and works even in landscape mode. 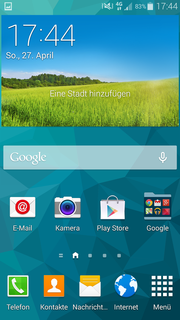 Despite the dozens of functions, the operation of the Galaxy S5 is intuitiv and easy. 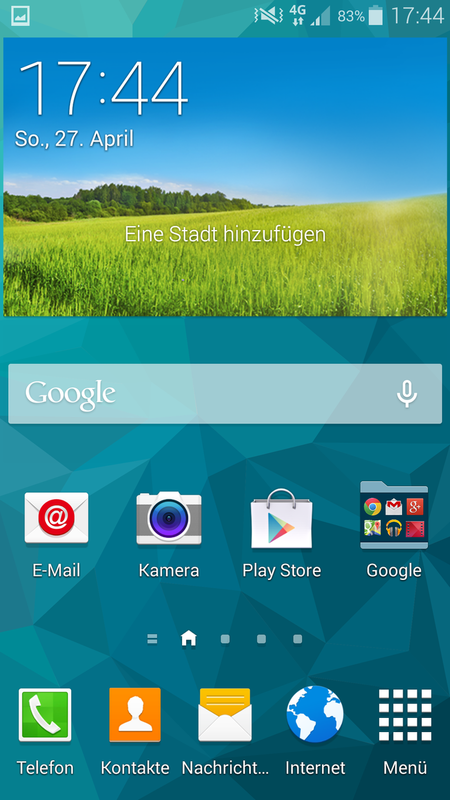 The home sceen is not much different from the Galaxy S4. Samsung does a good job of guiding the user through the different functions - some of which will be uncovered weeks later. "Dead on Arrival 2" checks the different settings before the first bootup and confirms that the Galaxy S5 is quite powerful. Multi-tasking is also possible. Here we are looking at photos while surfing the web. A look at the optional "Gear Fit", which is a combination of a fitness bracelet and a smartwatch. The device is easy to configure; set up is possible from a smartphone app. Neither the fitness functions nor the smartwatch activities seem mature enough. That Samsung managed to improve its flagship smartphone in a meaningful way. Operation is intuitive and quick despite the dozens of options.